We flew from Copenhagen airport to Muscat via Bahrain on 31 December, arriving in Muscat just a couple of hours before New Year; we returned via the same route on 16–17 January, taking an overnight flight from Bahrain to Copenhagen. All flights were with Gulf Air, total cost 3219 SEK (£310). In addition, SM flew from Manchester to Copenhagen with EasyJet; flights between Christmas and New Year were expensive (c.£150) but the return flight was more in line with the expected price for this route (c.£50). We hired a 2WD car from Europcar at a cost of £667 for 16 days. Our vehicle, a Toyota Camry, proved to be largely suitable for our needs; there were only a small number of places we were unable to access and this was usually due to the low frame of the car and deeply rutted tracks/potholes — the surface of the track itself was seldom an issue and it’s likely that with a higher-framed 2WD we would have been able to access more areas. Our vehicle was an automatic; not ideal for off-road desert driving, though we had no problems. Driving in Oman is easy. Away from the cities, there is very little traffic. Desert highways are long, straight and flat — though watch out for local drivers who take advantage of this with excessive speed! As with driving in any Middle Eastern country, expect the unexpected and all will be fine: persons wandering around on 120 km/h duel-carriageways; vehicles backing out of parking spaces with no warning; goats and camels etc. You can leave/enter many of the main roads at any point by simply pulling off at a point where the gravel sides are not too steep; watch out for vehicles joining or leaving the road at any point... though this also proves to be hugely useful for birding when accessing side tracks or stopping for road-side birds! 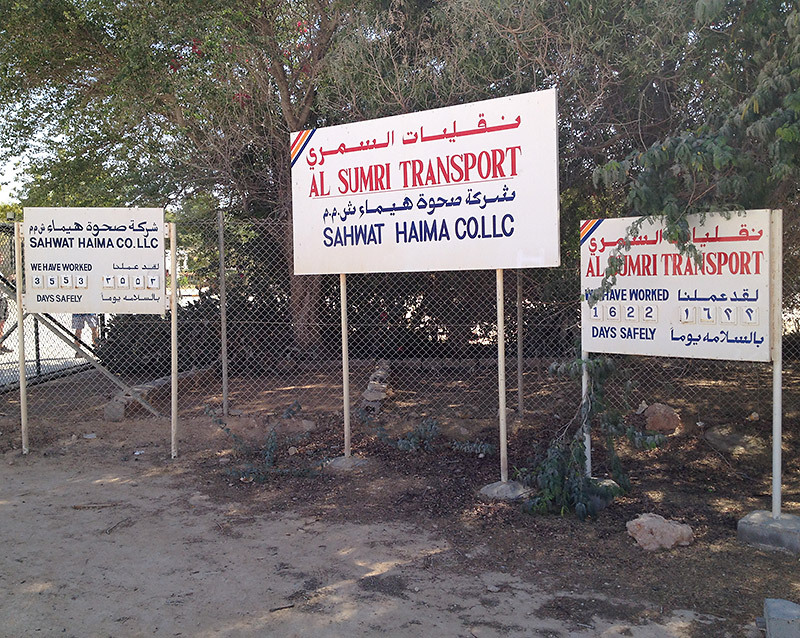 All major roads are tarmac, as are most of the smaller roads around Muscat and Salalah. Where tracks are not tarmac, the road surface is often compressed gravel, which is equally as adequate to drive on. It’s worth mentioning the speed-bumps; these presented the only real danger to our car. 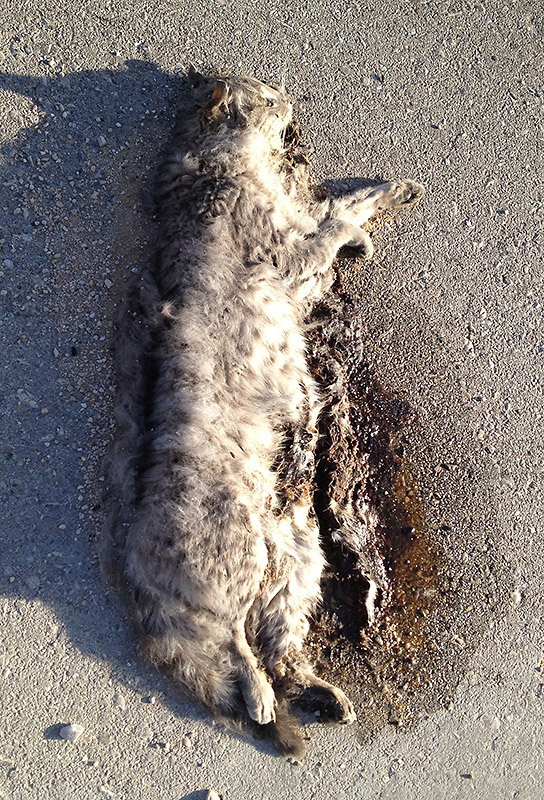 They’re common along roads in inhabited areas, though there is often no or little warming for them. Some are marked and painted will yellow chevrons; others are unmarked black tarmac. And they can be lethal; many are built with 4x4s in mind and, even crossing them at a snail’s pace, the sound of scraping metal was still an all-too-common backing track whilst driving through towns. Petrol was cheap; a litre of regular unleaded cost around 0.114 Rial = £0.18/L! We camped for the entire duration of our stay. We had no problems finding camping spots and had no issues. Most open areas, even those close to the cities, are quiet at night. It’s often impossible to hammer tent-pegs into the ground (too hard or too soft/sandy), so a free-standing tent is essential. Breakfast and lunch usually came out of a tin: small supermarkets and bakeries are easy to find. Evening meal was often in a local restaurant. The food was extremely good (curries, shawarmas etc) and extremely cheap; a curry typically cost 1 Rial (= £1.60). Bottled water (which, by the way, at around £0.26/L is dearer than petrol) was available in all shops and restaurants. The water in Oman is chlorinated and water trucks were seen delivering water to even the smallest remotest village; while we didn’t directly drink the water, we did eat salads etc and suffered no stomach upsets at all during our stay. There are very few feral dogs in Oman with just a few encountered at the dump in Salalah and around Muscat (and they generally gave no cause for concern). Biting insects were generally not a problem; only when camping at Khawr Rawri were we pestered by mosquitoes. Oman is officially malaria-free; however, neighboring countries are not and it’s advisable to use DEET repellant when in areas with mosquitoes. Daytime temperatures during our stay varied from 19–34 °C, with typical temperatures around 27 °C. The temperature drops a lot overnight in the desert regions and we were glad of our sleeping-bags in the early hours of the morning whilst camping in the desert. Away from the airport, payment by credit card in shops, restaurants etc seemed to be impossible — in fact, the “tills” in most establishments were often nothing more than a draw under the desk! However, ATMs were easy to find and we had no problems withdrawing money. It’s advisable to exchange some money before traveling; the quickest and easiest way to pay for the 20 Rial entry visa is with cash. From Salalah, we headed southeast to Barr Al Hickman area. From there, we headed south/southwest, roughly following the coast as far as Ash Shuwaymiyyah. A new tarmac road, not on most maps, links Sawqirah (18°10'45.22"N 56°32'34.82"E) to the road to Ash Shuwaymiyyah (18° 7'3.60"N 55°39'31.11"E). From there, a new road is being build towards Salalah; it is not yet complete, and we had to follow the road northwest (inland) and then southwest to meet the main central highway, which took us down to Salalah; we spent five days exploring the Salalah area. 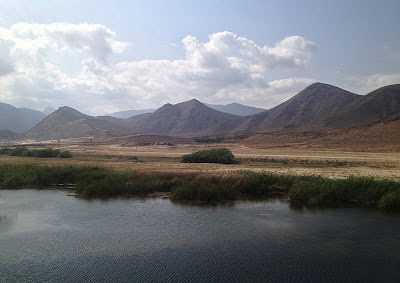 From Salalah, we headed north along the central highway, through the desert to Muscat before spending the final few days of the trip exploring the north coast. We drove 4,500 km (2,800 miles) over our 16 day stay. The approximate route taken; we travelled in a roughly clockwise direction. We carried with us binoculars, telescopes and cameras/lenses; we had no issues with airport security nor did these cause us any issues whilst we were in the country. Binoculars proved to be extremely popular with locals, who always wanted to take a look through them — but seldom wanted to look through the scope! We took with us Fågelguiden/Collins Bird Guide (Svensson, Mullarney & Zetterström, 2010), Birds of the Middle East (Porter & Aspinall, 2010), Birds of the Horn of Africa (Redman, Stevenson & Fanshawe, 2009) and Birds of the Indian Subcontinent (Grimmett, Inskipp & Inskipp, 2011). 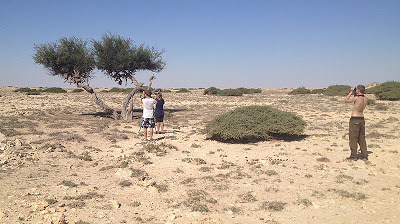 Additionally, we carried with us a copy of Birdwatching guide to Oman, second edition (Sargeant, Eriksen & Eriksen, 2008), which proved to be invaluable at many sites. In this report, we refer to sites published in the book using their site number and map waypoint — for example, 8.1/A44 refers to Barr Al Hickman (site 8.1), Filim (waypoint A44). We follow the English spellings of place names give in the same publication. We used GPS satellite navigation loaded onto our phones for navigation across the country. An iPhone loaded with GPS Kit app allowed us to note waypoints; in the report, we give global waypoints for any sites not covered in Sargeant, Eriksen & Eriksen or for sites where we feel more precise information would be helpful. 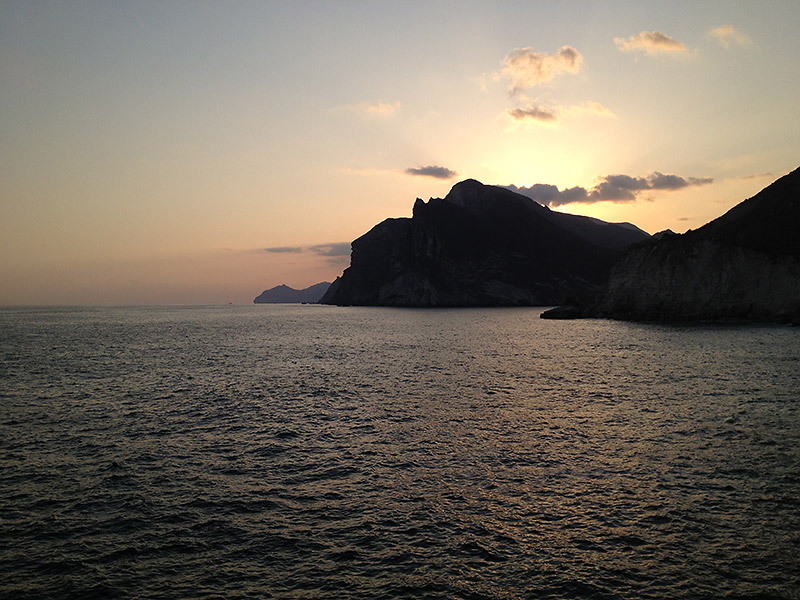 Finally, we used a number of online trip reports to glean additional information. We especially thank Petter Olsson who shared with us a large quantity of information from his trip to Oman in December 2012. All photographs in this report are © Stephen Menzie; most were taken using an iPhone 4S through a Kowa TSN-883 scope. After a good flight with a direct airside transfer through Bahrain, we arrived in Muscat international airport in the last few hours of 2012. Our baggage had been transferred and had all arrived, though had clearly been handled rather roughly on the way. There was no queue at the Europcar desk and we’d soon collected our car and started the journey south. 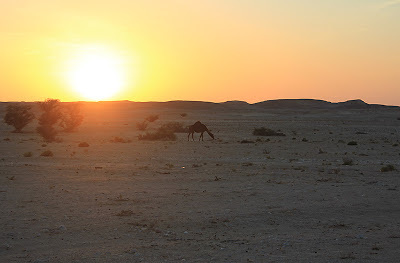 We drove through the night, arriving at Filim (Barr Al Hickman) in the early hours of the morning. Filim (8.1/A44) As the sun began to rise, it became apparent that the bay — viewed from the small car park just before the desalination plant at the end of the road — was full of waders: Broad-billed Sandpipers, Greater Sandplovers, Lesser Sandplovers, Terek Sandpipers and Little Stints. Most birds were distant but some fed close in the bay. 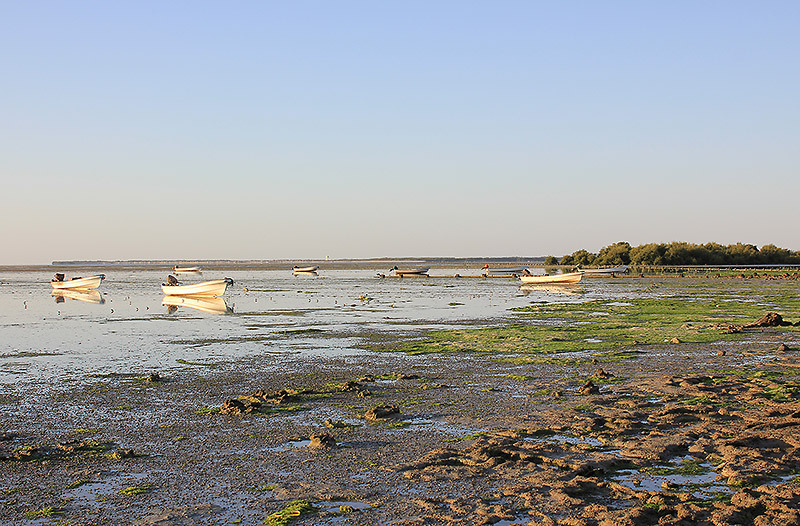 We hoped the rising tide would push the birds closer but instead, perhaps helped by the increasing activity of local fisherman as the tide rose, most moved on elsewhere. A flock of Crab Plovers flew past some distance away. 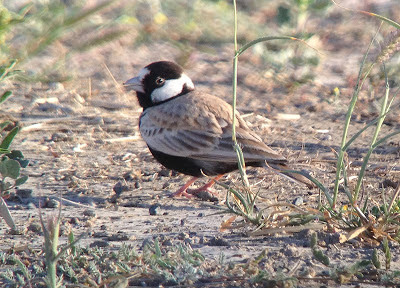 We also had chance to see our first individuals of species that would prove to be common throughout the trip: Whiskered Tern, Western Reef Egret, Teal, Garganey, Desert Wheatear, Laughing Dove, Slender-billed Gull, Brown-necked Raven and Clamorous Reed Warbler. 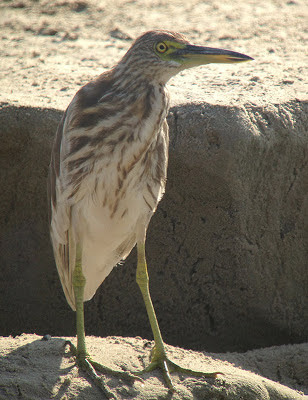 A trip to the island of Mahawt with a local fisherman proved to be a rather costly activity with nothing of note seen, except for our only Little Egrets in the Barr Al Hickman area. We explored the area along the track to the northwest of Filim (8.1/A46) and the area along the road northeast of the village but with little of note. Al Hijj We stopped at an area of open ground east of the Filim-turning roundabout in the town of Al Hijj (c.20°45'38.72"N 58°17'42.63"E). Here, we added our first Plain Leaf-warbler, Indian Roller, White-cheeked Bulbul, Booted Eagle and Purple Sunbirds of the trip to the list; a small pool a short distance away held a Red-wattled Lapwing. Shannah Beach We tried to access the east coast of Barr Al Hickman along the track by the communications tower at 8.1/H02 and 8.1/H04 but found it impassible due to our car’s low chassis. As an alternative, we drove as far as Shannah (8.1/H06) and parked at the end of the beach; from there, we walked southeast along the beach. It paid off with 256 Crab Plovers seen in addition to huge numbers of other the same wader species seen at Filim, plus Sanderling and Bar-tailed Godwit. 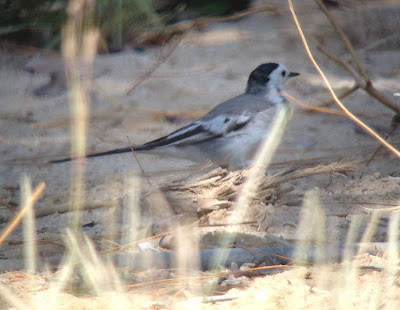 The walk along the beach also produced two Isabelline Shrikes (isabellinus — the only race we sure during our visit), Greater Crested Tern, Lesser Crested Tern, and Sooty Gull. Many of the waders were further south along the beach but, with the sun setting, we had to turn back earlier than we would have liked. The night was spent at the start of the the aforementioned impassive track where the sand was firm and flat. Shannah Beach We started the day back at Shannah Beach, as yesterday. 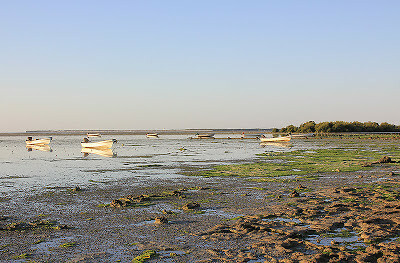 We had more time today and walked up the beach as far as the start of the low mangroves (20°44'29.03"N 58°42'36.28"E). From here, we had 500+ Crab Plovers along with the same wader species as recorded the evening previous. We failed to locate any Great Knot. 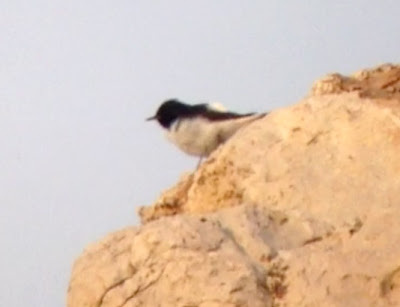 The walk along the beach produced, in addition to yesterday’s species, a Red-tailed Wheatear, some Sand Martins, a Barn Swallow, and a Pallid Swift moving north along the coast. At high tide, many of the waders flew inland to roost (with the exception of the Crab Plovers, which roosted on the beach). 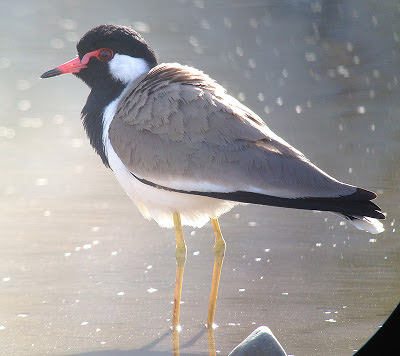 Greater (left) and Lesser Sand Plover, Shannah Beach — they'r easy when they look like this! We left Barr Al Hickman and headed south along Highway 32. The only sighting of note was a roadside Long-legged Buzzard at 20°31'8.87"N 57°56'31.90"E. The area around 20°28'4.97"N 57°50'18.79"E looked like it might have been productive, though we didn’t have chance to stop and explore. “Fairly Salty” Wadi At the advice of Petter Olsson, we stopped at the wadi at 20°19'42.43"N 57°47'26.02"E. We’re unaware of any official name for the wadi – though, since the water is flowing and apparently permanent, it probably does have a name, at least local. 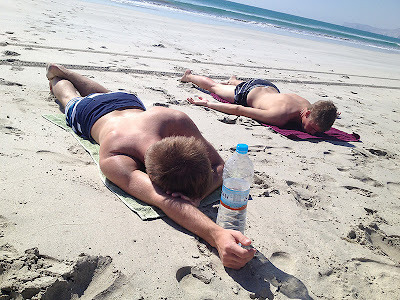 Following a comment in Petter’s trip report — “the fairly salty water” — the wadi acquired the nickname “Fairly Salty” Wadi. Access is through the broken crash-barrier on the east side of Highway 32. A short exploration of the wadi before dusk provided us with our first Ménétries’s Warbler of the trip, Black Redstart, White Wagtail and Grey Wagtail; at 16:30, ten Crowned Sandgrouse arrived to drink from the flowing water on the south side of the wadi. We camped at the entrance to the wadi. A lot of animal tracks led down to the water and through the area where we were camping (jackals, foxes, camels etc) though the only mammals we encountered during the night were two Donkeys. 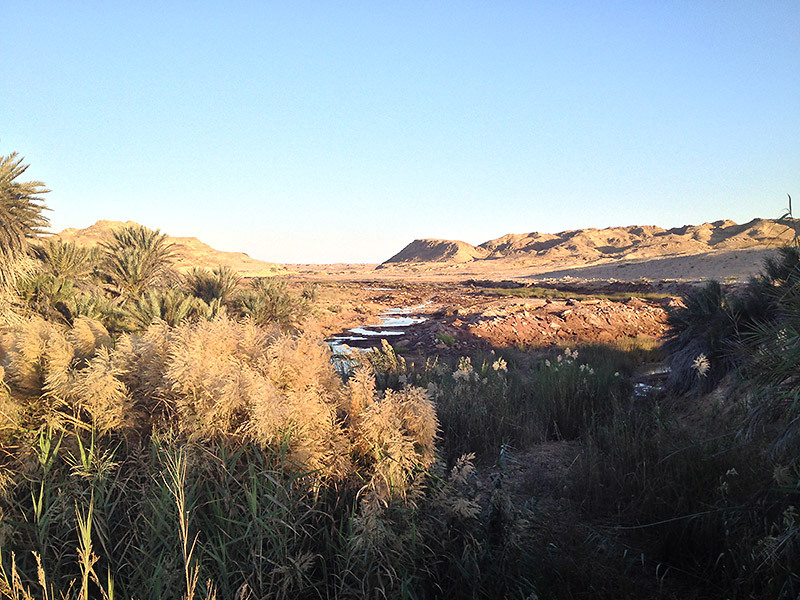 “Fairly Salty” Wadi At 04:30, a Pharaoh Eagle Owl was seen hunting south of the wadi. 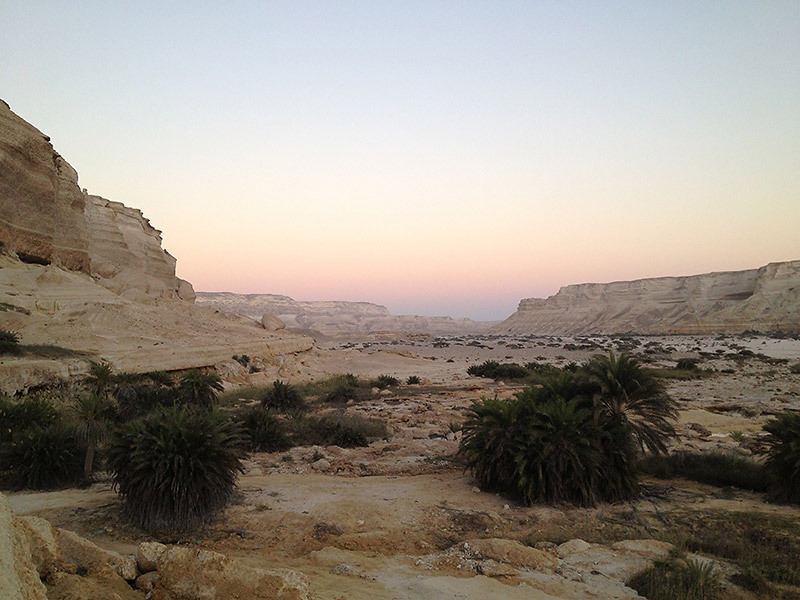 As the sun rose, we explored the area west of the road as far as the obvious natural stone wall at the end of the wadi (20°19'52.60"N 57°46'54.55"E). Here, we found a Red-tailed Wheatear stalked by an Asian Desert Warbler and loosely followed by a Ménétries’s Warbler and a Lesser Whitethroat. Two Desert Larks were on the stoney plane between here and the road. 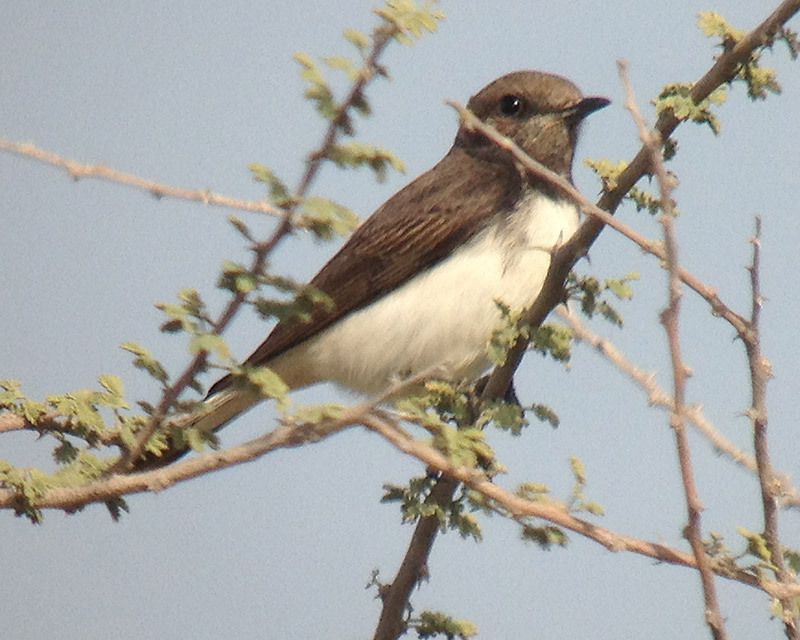 Back at the wadi east of the road, a drake Pintail was present and at least two Plain Leaf-warblers were seen/heard. Between 08:30 and 09:15, 6-+ Chestnut-bellied Sandgrouse flew in and settled in the stoney areas south of the wadi, where a small flock of Black-crowned Sparrow-lark were also present. We continued south along Highway 32 — a roadside stop at 20° 1'41.24"N 57°42'47.59"E produced large numbers of Black-crowned Sparrow-larks — then east along Highway 41, where we stopped briefly at 19° 5'0.90"N 57°35'57.87"E when a Hoopoe Lark ran across the road in front of us. Wadi Gharm (9.2/E20) It was the hottest part of the day when we visited this site. A local pointed out to us Spotted Thick-knee footprints in the sand but we failed to find the birds themselves; we did however find our first Grey Francolins and saw our only snake of the trip (a Sand Racer or similar). Khawr Dhurf (9.2) This site was not great on our visit, perhaps because the low chassis to our car limited the tracks we could take. A number of ducks were seen, including Wigeon and Shoveler, as were three Eurasian Spoonbills. A Pallas’s Gull was viewed distantly on the beach. We continued southeast, stopping at 18°42'23.49"N 56°40'32.13"E where a confiding Lilith Owl showed well on some half-build buildings by the side of the road; two Hoopoe Larks were also present. 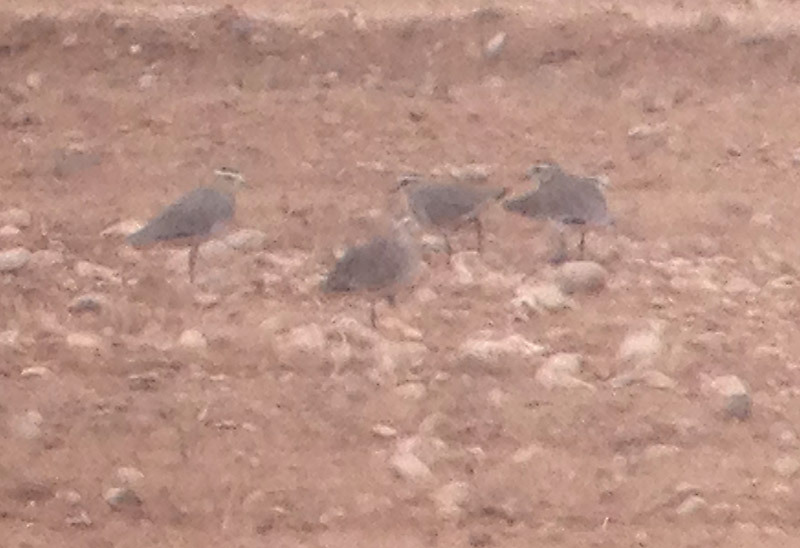 A further stop at 18°28'24.57"N 56°35'11.40"E as dusk fell failed to produce the hoped-for Spotted Thick-knee but we did find a flock of nine Arabian Babblers as they went to roost. From here, we followed the road Sawqirah then took the newly built tarmac road to Ash Shuwaymiyyah, cutting out the need for a length drive inland to pick up the highway before heading back out to the coast. Ash Shuwaymiyyah (9.4) We arrived after dark and made our way up into the wadi. It was easy to find with a wide compressed-gravel track leading first across the stony plain and then into the mountains from the west side of the village (9.4/E55) — this point can be accessed through the village but, to avoid the speed-bumps, one can so access the point by taking the track to the north of the main road just before one crosses the bridge over the wadi (17°52'59.36"N 55°36'10.98"E). With a 2WD, it’s no problem to drive the track along the wadi all the way to the date plantation at the end of the wadi (9.4/E57); indeed, the only thing that stopped us going further was a sharply-angled incline in the road that our low car was unable to pass over. Driving the length of the track with a torch out of either side of the car, we managed to spot three canids at three different points. 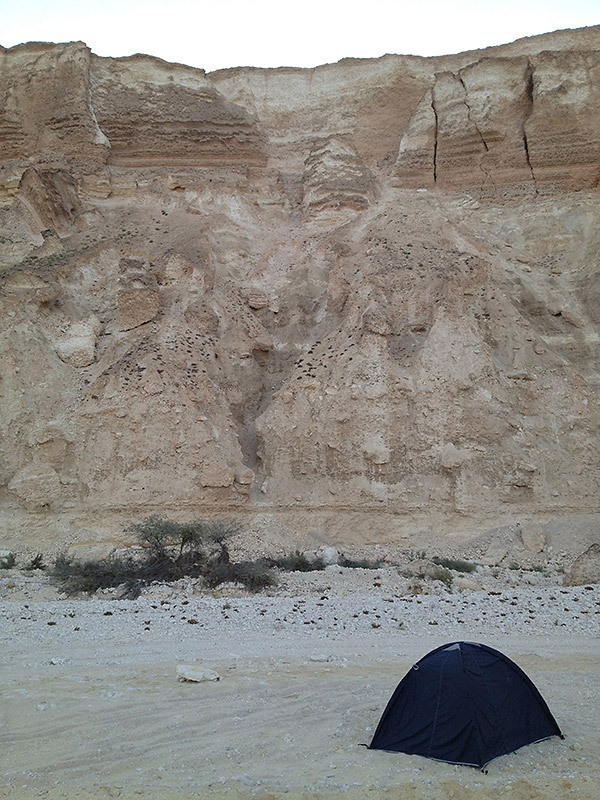 We camped in the upper reaches of the wadi (17°54'33.20"N 55°28'34.05"E). Ash Shuwaymiyyah We awoke to the sound of a pair of Hume’s Owls calling from the cliffs above our chosen campsite; they were vocal from 05:00 to 06:15 though remained out of sight. Exploring the wadi from here down towards the town produced Arabian Wheatear, Tristram’s Starling (both common), five Striolated Buntings and at least four Tawny Pipits. The lagoon west of the town (viewed from 17°52'57.82"N 55°36'12.54"E) held an Indian Pond Heron, a couple of Pallas’s Gulls and a Lesser Black-backed Gull amongst the other large gulls, a Greater Crested Tern, a Ruddy Shelduck, a Ferruginous Duck, two Pintail, two Shoveler and three spoonbills. Taking the road west of the town towards Jinawt (9.4/E60), we stopped at the beach about halfway along — the beach can be reached from the road by a series of tracks, though you might have to try a couple before you find a track that takes you all the way. From here, we saw several Masked Boobies, several Socotra Cormorants, a Pomarine Skua and a Red-tailed Tropicbird; plenty of Red-necked Phalaropes were present out at sea. We also enjoyed a much-needed swim in the ocean. We followed the newly built road (indeed, still being build in many cases) to the west, where it rises into the mountains at the end of the bay. 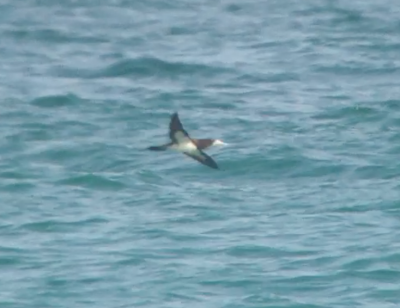 From the vantage point at 17°48'31.42"N 55°25'7.40"E we watched a flock of 350 Socotra Cormorants loafing close in sure as well as obtaining better views of Masked Booby. Back towards the town, exploring the area of rough ground to the west of the pools we found a Steppe Grey Shrike and two Isabelline Shrikes. We returned to the wadi at dusk, to the hanging gardens (17°56'2.48"N 55°31'35.46"E). Running water here creates a small pool and attractive waterfall; judging from the animal prints, a lot comes to drink here at night. We found many fox/jackal prints, some cat prints, and a set of wolf prints. A set of obvious black-and-white steps leads up to two rather vulgar shaded seating areas beside the ‘pool’ below the hanging gardens; we sat here and waited for it to get dark. Between 18:15 and 18:25, just after darkness had fallen, 20–30 Lichtenstein’s Sandgrouse came to drink at the shallow pool, just 15m away from where we were sitting. Again, we drove the length of the track looking for mammals. 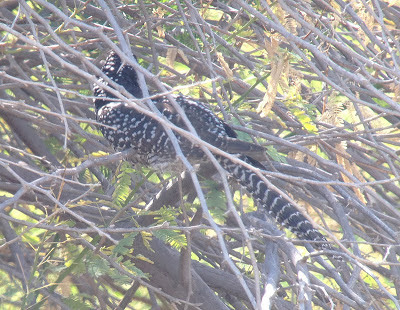 This time we found a Wild Cat on top of a low escarpment near the top of the wadi and some unidentified eye-shine by the water’s edge where the river crossed the road close to the date plantation. 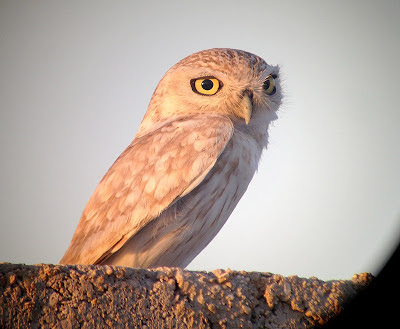 In a side wadi near to the date plantation (17°54'19.81"N 55°27'25.86"E), a pair of Hume’s Owls were calling but were not seen; some 2km (1.2 miles) from where we had camped, so presumably a different pair. We camped in the same spot as the previous night. Ash Shuwaymiyyah We again woke to the sound of the pair of Hume’s Owl. 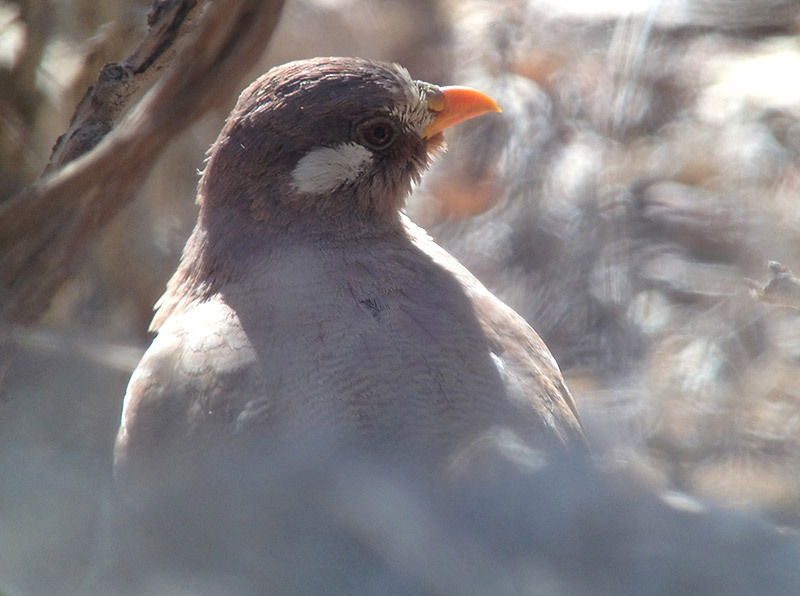 Exploring the wadi as far as the date plantation gave us our first African Silverbills of the trip, a Bonelli’s Eagle, at least nine Striolated Buntings and 15+ Arabian Partridges. 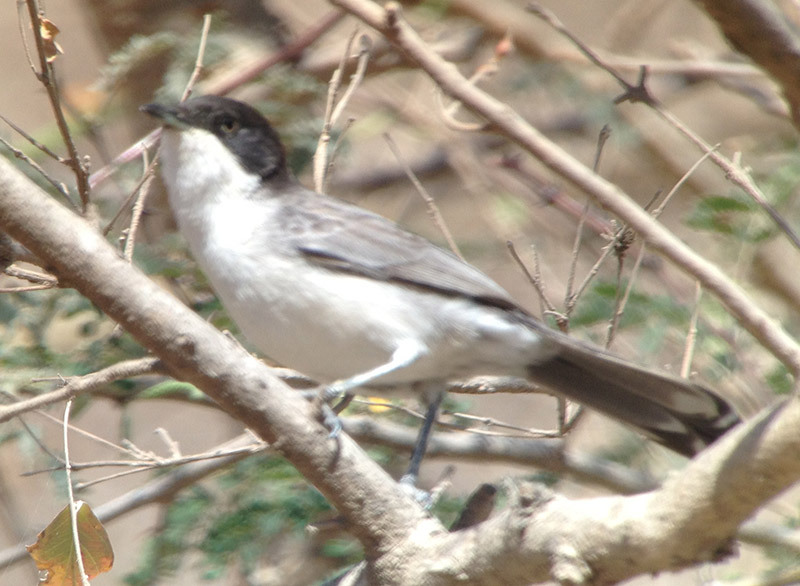 A White-breasted Waterhen was present on the river close to where it crosses the track (17°54'34.59"N 55°27'24.53"E), as were our first Shining Sunbirds of the trip, a Lesser Whitethroat and an Arabian Warbler. 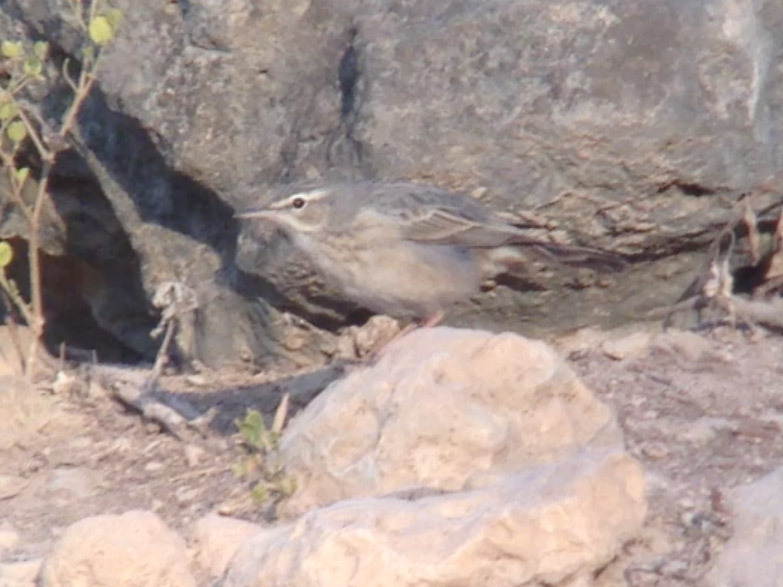 Other sightings in the wadi included 12 Sand Partridges, four Desert Larks and a Ménétries’s Warbler. 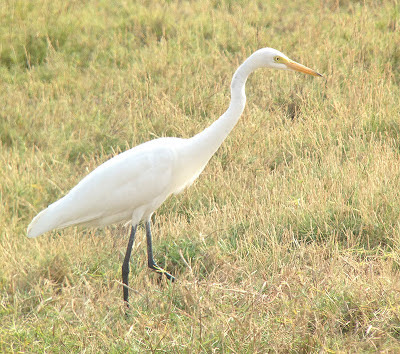 On the town lagoon, four Eastern Cattle Egrets (ssp. coromandus) were seen along with a single Pallas’s Gull, a single Black-headed Gull and at least four Greater Crested Terns. The road from Ash Shuwaymiyyah to Salalah is still in the process of being built; consequently, we had to head back inland to meet up with the main central highways to reach Salalah. 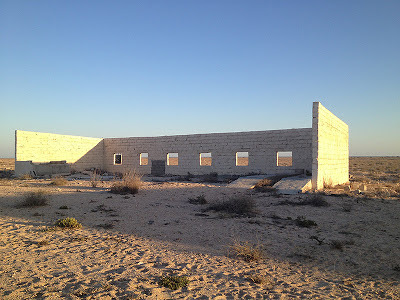 Traveling along Highway 39, we passed Marmal contractors camp (18°10'32.75"N 55°12'41.97"E) — a well-vegetate area in what is otherwise barren desert. We asked permission to enter the compounds, which we were granted. 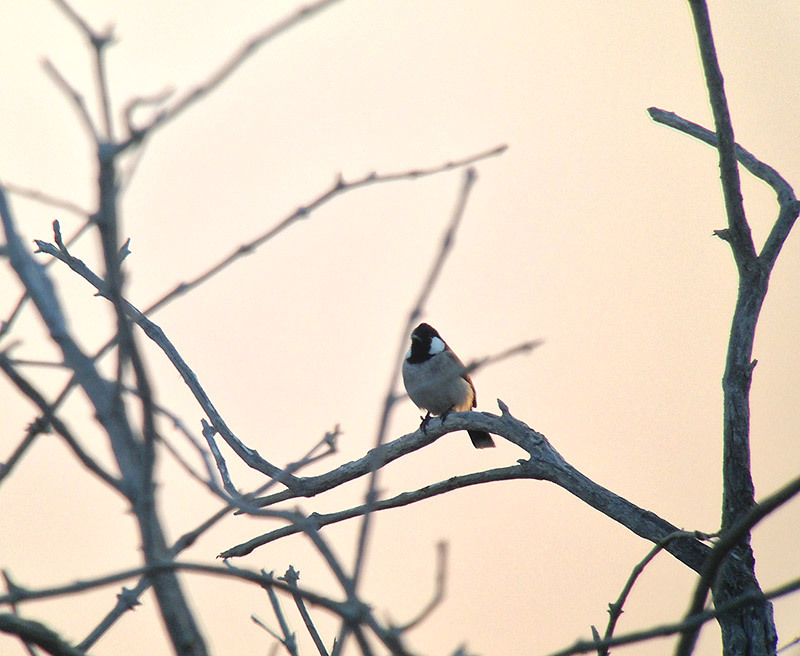 We found nothing more exciting than some House Sparrows, Collared Doves and White Wagtails. However, we couldn’t help feeling that the area should act as a migrant trap during migration periods and it might be worth checking if you are passing the area. 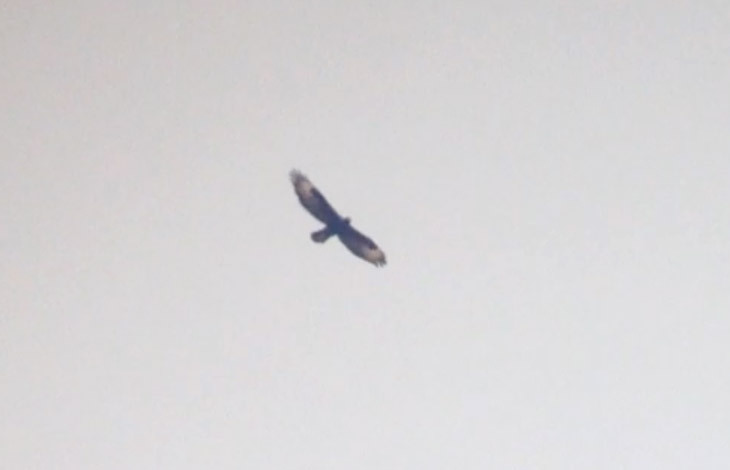 Further roadside stops produced a Steppe Eagle at 17°48'48.65"N 54°39'32.69"E; a Greater Spotted Eagle, 80+ Greater Short-toed Larks, a Hoopoe Lark, some Black-crowned Sparrow-larks and some Chestnut-bellied Sandgrouse at 17°48'18.66"N 54°36'54.40"E; and a Griffon Vulture, at least six Lappet-faced Vultures, two Imperial Eagles and an immature Egyptian Vulture at 17°47'57.53"N 54°32'11.26"E.
Wadi Rabkut (7.7) We spent the last few hours of the day here. It’s possible to drive a 2WD vehicle along the track as far as 17°41'11.33"N 54° 9'45.28"E. From here, we continued on foot individually in different directions. 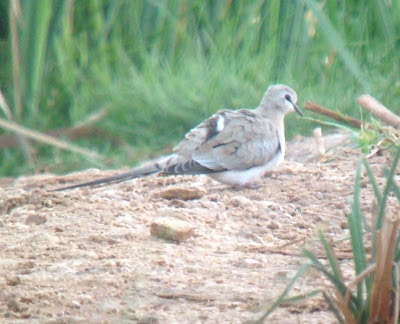 Collectively, the best sightings were 6 Spotted Sandgrouse and an Asian Desert Warbler. 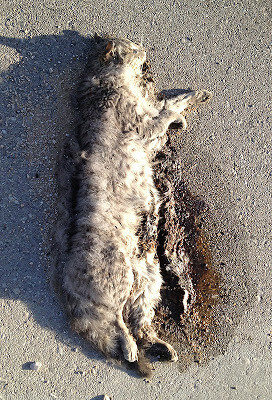 A Wild Cat was dead on the road that crosses the wadi. Salalah We arrived in Salalah late in the evening. 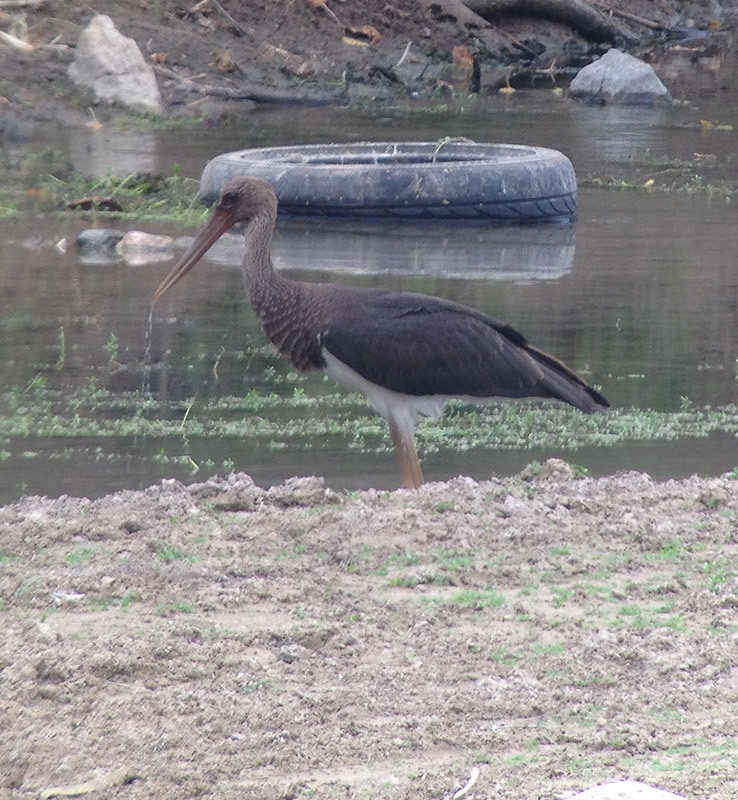 Traveling through the city, two Spotted Thick-knees were seen on a patch of road-side waste-ground. Unfortunately there was nowhere to stop and we had to continue. Salalah Crowne Plaza resort The Salalah Crowne Plaza resort is located to the east of Salalah city at 17° 0'32.21"N 54° 9'5.01"E. We easily found two Spotted Thick-knees here; one around the villa complex and one on the small golf course behind the main hotel building. 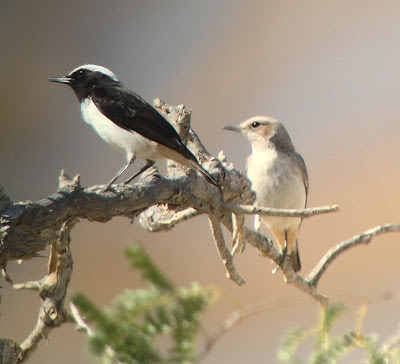 Petter Olsson recommends combining a visit here with a trip to the bar (which overlooks the golf course) but, after five full days in the field, we were hardly dressed for the occasion and continued eastward to Wadi Darbat. Wadi Darbat (10.8) On arrival, a Genet ran across the road in front of the car. 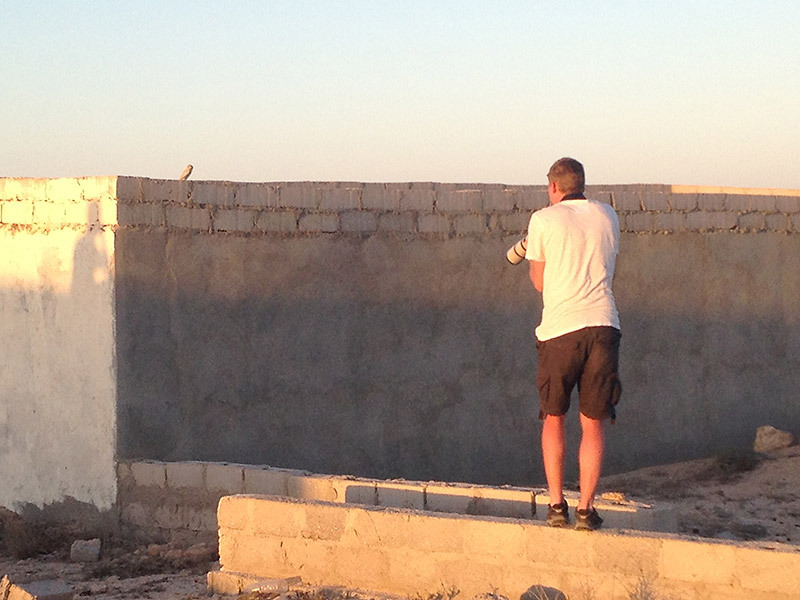 We were greeted by the sound of Arabian Scops Owls. We camped just off the road a few hundred metres before reaching the café/toilet block (10.8/G12). 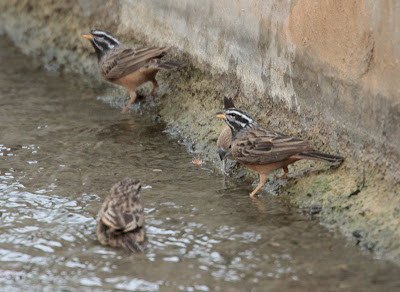 Wadi Darbat The birding here was in contract to the previous five days. 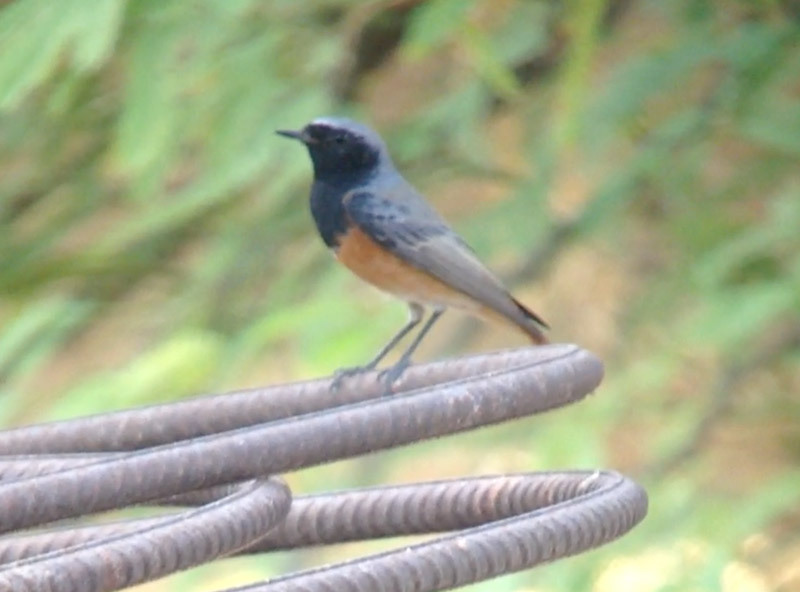 It had felt like we were birding in the Western Palearctic; now, things felt a lot more African: Africa Paradise Flycatcher, Abyssinian White-eye, African Rock Bunting, Rüppell’s Weaver and Bruce’s Green Pigeon were all seen between where we had camped and the café/toilet block. Overhead, at least five Greater Spotted Eagles soared over the wadi (including 1 second-year ‘fulvescens’) along with two Short-toed Eagles, two Eastern Imperial Eagles and two Fan-tailed Ravens. A Bonelli’s Eagle hunting low in the valley brought down a Black-crowned Night Heron just metres away, several Arabian Warblers and a Hoopoe were in the trees around the café/toilet block, and Wood Sandpipers, Little Egrets and Citrine Wagtails were around the pools. 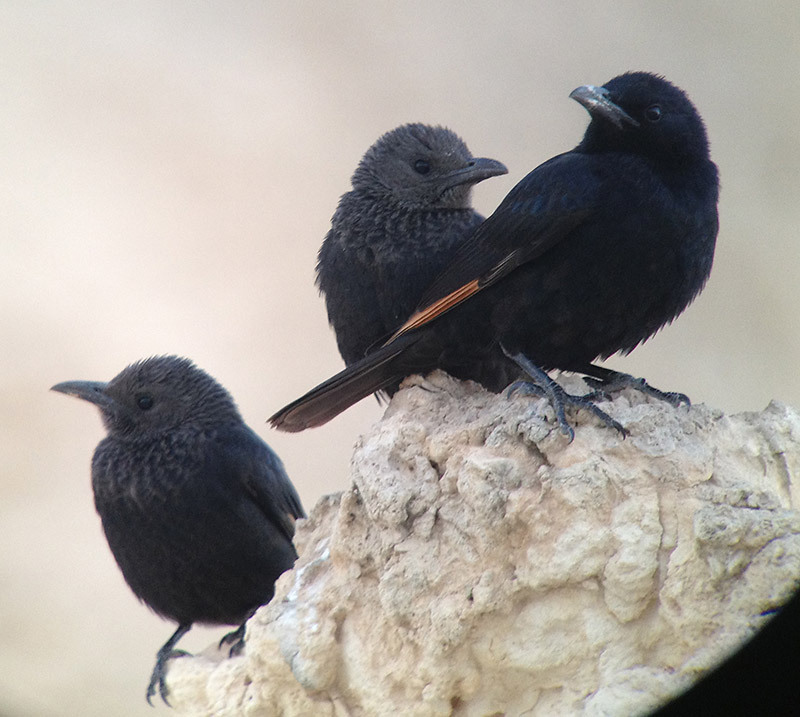 Wadi Darbat was certainly an exciting place to be birding! Ayn Hamran (10.4) West of Wadi Darbat lies Ayn Hamran. We parked at the roundabout at the end of the tarmac road (10.4/F95) where we had good views of the hills to the north. 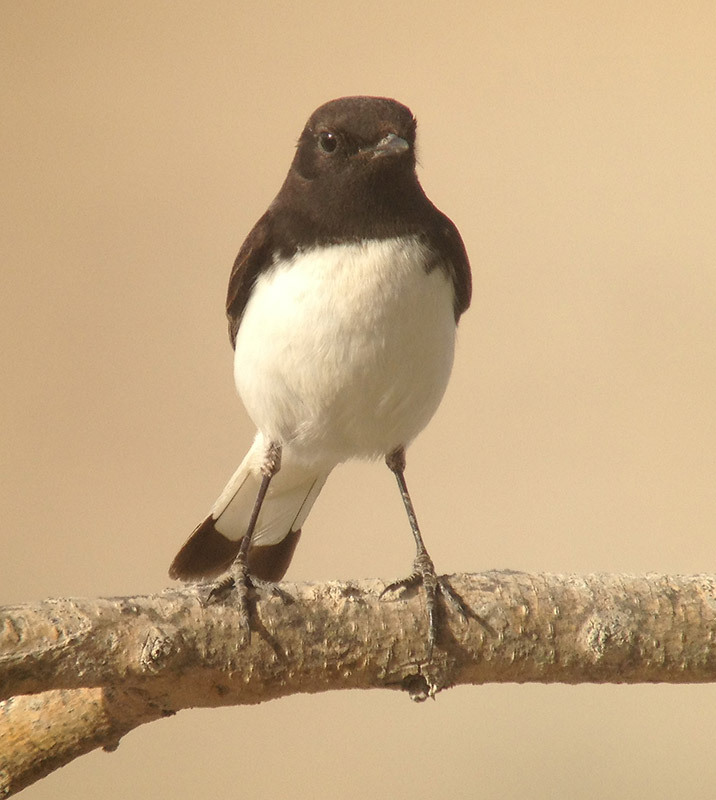 We occupied ourselves watching the many African Rock Buntings, Abyssinian White-eyes and White-spectacled Bulbuls that come to drink in the irrigation channel that runs along the east side of the roundabout. At 11:30, an adult Verreaux’s Eagle was seen soaring over the western end of the hillside in the company of a Bonelli’s Eagle; a flock of White Storks flew over. Khawr Taqah (10.6) We initially struggled to find the best birding spots at this site. 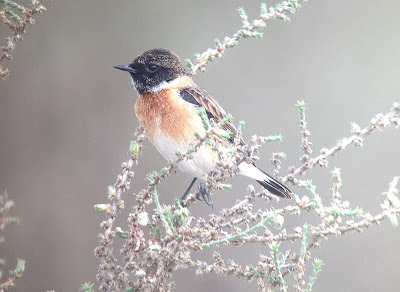 Driving west from the bend in the road (10.6/K58), past the beach play area and out across the flat sandy area, we reached a marshy area (17° 2'10.25"N 54°22'22.21"E) that held a male Siberian Stonechat and several Common Snipe. It was clear that there was water behind the wall of reeds but it was virtually impossible to view — a small gap in the reeds allowed us to see only a few Moorhens and Coots. 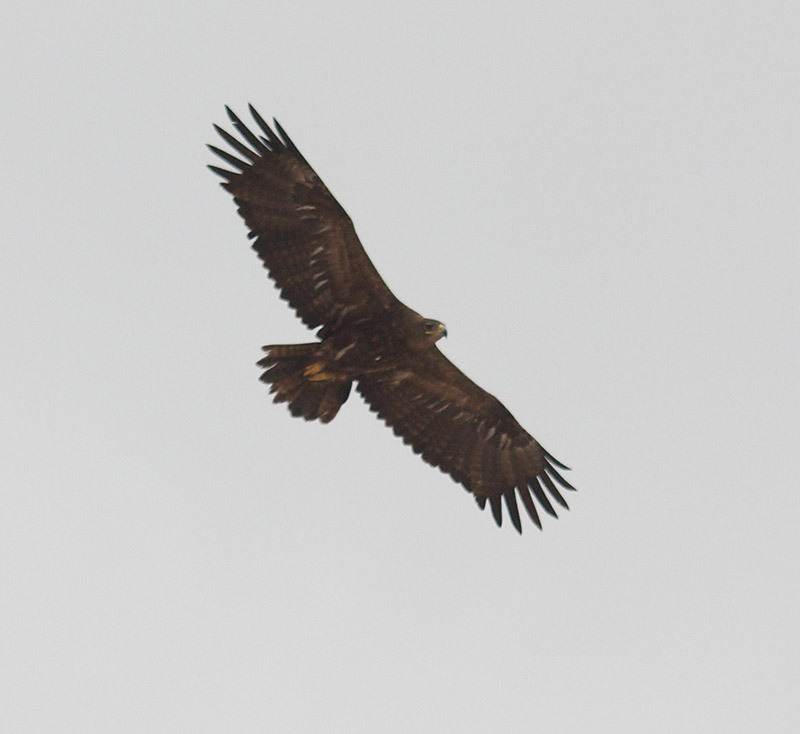 We travelled into Taqah town to stock up on supplies and, whilst in the supermarket car park (17° 2'23.43"N 54°23'10.62"E), had two Yellow-billed Kites flying overhead. Four Common Mynas were also seen along the road. Back at the Khawr, we stopped at the pool by the beach play area/shelter (17° 2'1.91"N 54°22'44.05"E). 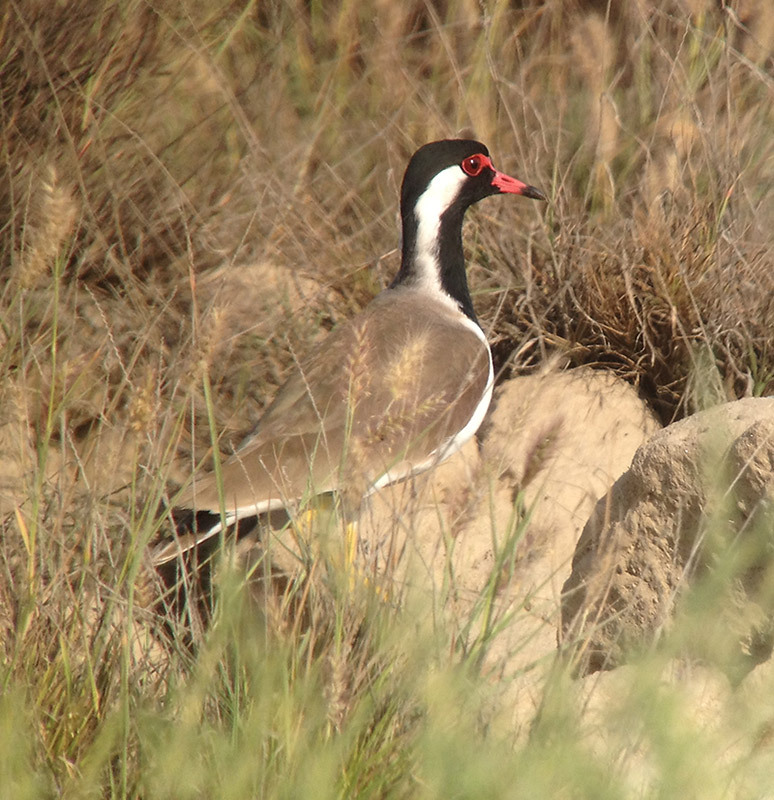 This proved to be the most productive area at Khawr Taqah with three Small Pratincoles, three two Indian Pond Herons, two Squacco Herons, a Whiskered Tern, a White-winged Black Tern, two Marsh Sandpipers with the Greenshank, six Black-winged Stilts, and an Isabelline Shrike all seen. On the beach east of here was a small roost of gulls and terns, including Steppe Gull, Heuglin’s Gull, Sooty Gull, Slender-billed Gull, Greater Crested Tern, Lesser Crested Tern and Sandwich Tern. Khawr Rawri (10.7) We took the track north from the main road to point 10.7/K65. 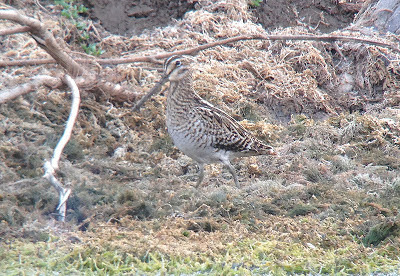 On arrival, a Watercock was feeding on the marshy area to the west of the north arm of the Khawr with Moorhens. 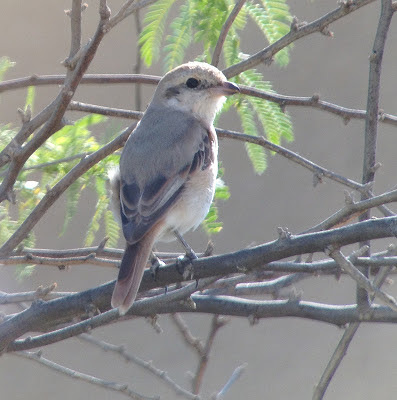 This represents the fourth record of this species for Oman. 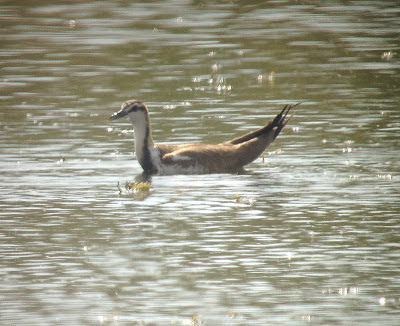 In addition to the Watercock, a Glossy Ibis, Graceful Prinia, three Common Snipe and several Bluethroats and Citrine Wagtails were seen around the marsh area and two Ospreys were fishing around the khawr; a drake Tufted Duck and 12 Wigeon were on the main body of water, viewed distantly from the rocky outcrop to the east of the north arm. 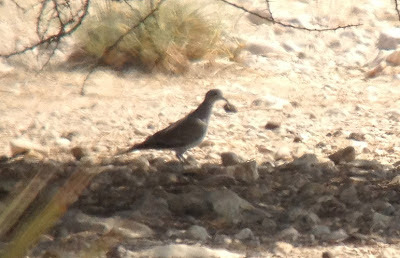 The same rocky outcrop held a Long-billed Pipit and some Rüppell’s Weavers while the scrubby area west of the north arm of the khawr held several Namaqua Doves amongst the numerous Laughing Doves. 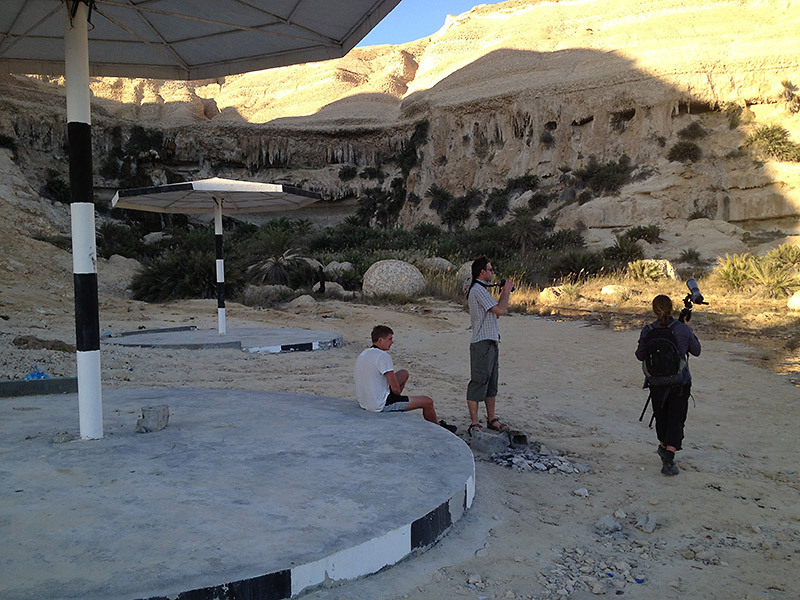 We travelled back to Wadi Darbat to camp at the same spot as the previous night. 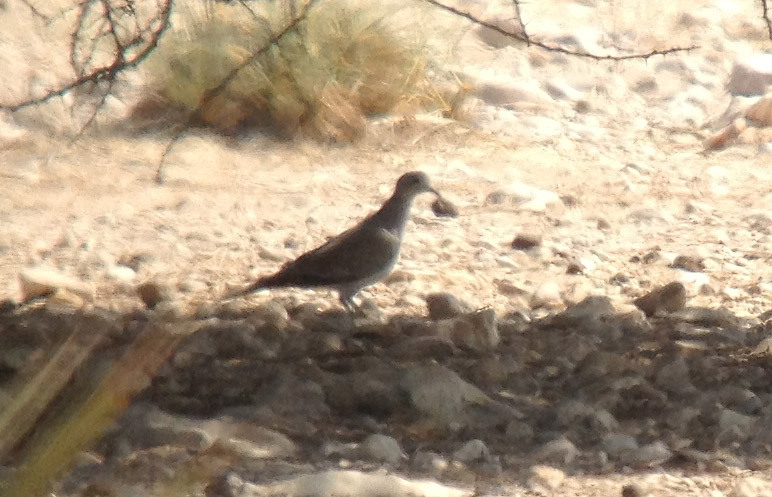 Wadi Darbat The only notable addition to yesterday’s sightings was a Pin-tailed Snipe on the pools with about ten Common Snipe. 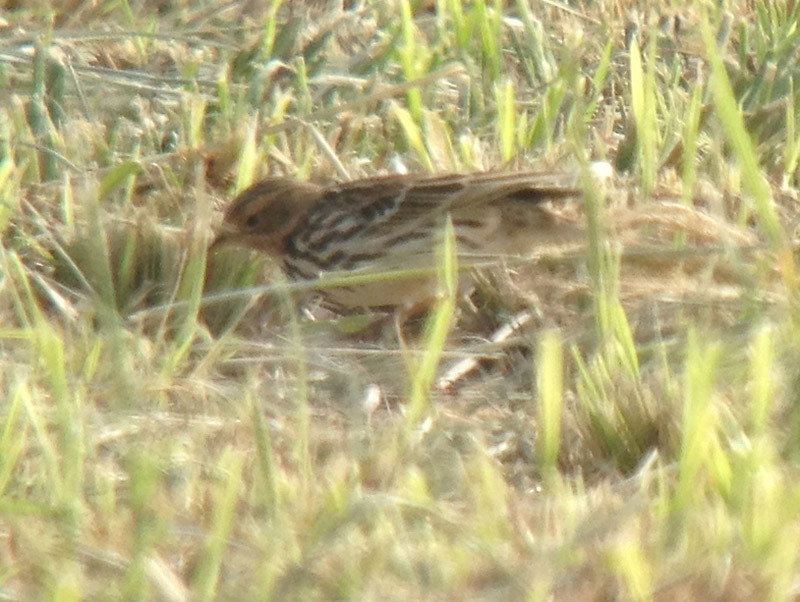 Ayn Hamran A Long-billed Pipit was seen along the entrance road (17° 5'3.44"N 54°16'46.69"E). 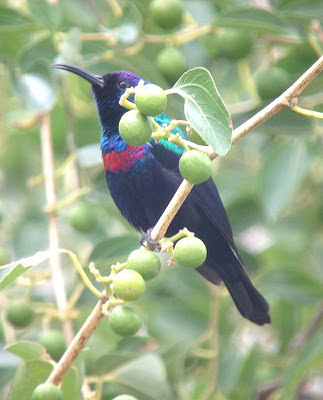 Both Shining Sunbird and Palestine Sunbird were seen around the roundabout. 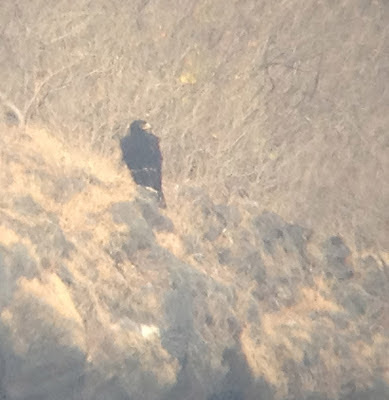 At 11:30, an adult Verreaux’s Eagle was again seen over the hills north of the roundabout — initially at the western end before moving to over the central valley where it landed; it was best located by looking for the two Fan-tailed Ravens who persistently mobbed the eagle. 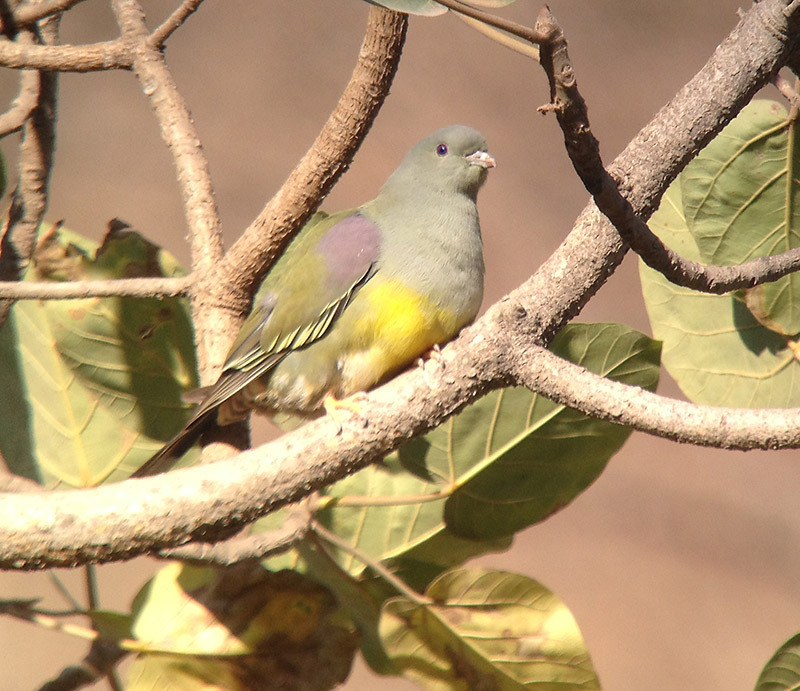 An Arabian Golden-winged Grosbeak briefly visited the drinking spot in the irrigation channel east of the roundabout. Khawr Taqah We visited a different area of the khawr today, parking by the road into Taqah north of the khawr close to the main road turnoff (10.6/K56) and accessing the khawr through the building site south of the road. It appears, comparing with past satellite-images, that the north end of the khawr is being made into a series of concrete-sided circular pools. It’s unclear how this will effect the birding here; the circular pools did hold 37 Cattle Egrets (35 ibis and two coromandus) and a Citrine Wagtail but little else. 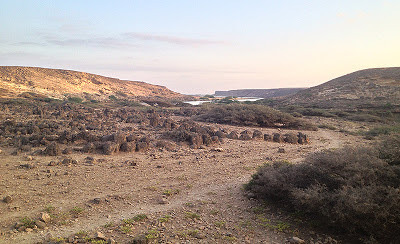 The well-vegetated area of water southwest of the circular pools, viewed from the concrete edge of the westernmost circular pool, held 2 Pheasant-tailed Jacanas and good numbers of Garganey. 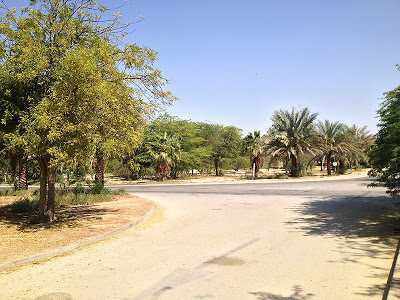 The ‘gardens’ on the other side of the road from this area were nice for sunbirds (Palestine and Shining) and wagtails; they also held several Ring-necked Parakeets and Common Mynas. Two Great Spotted Eagles passed overhead. 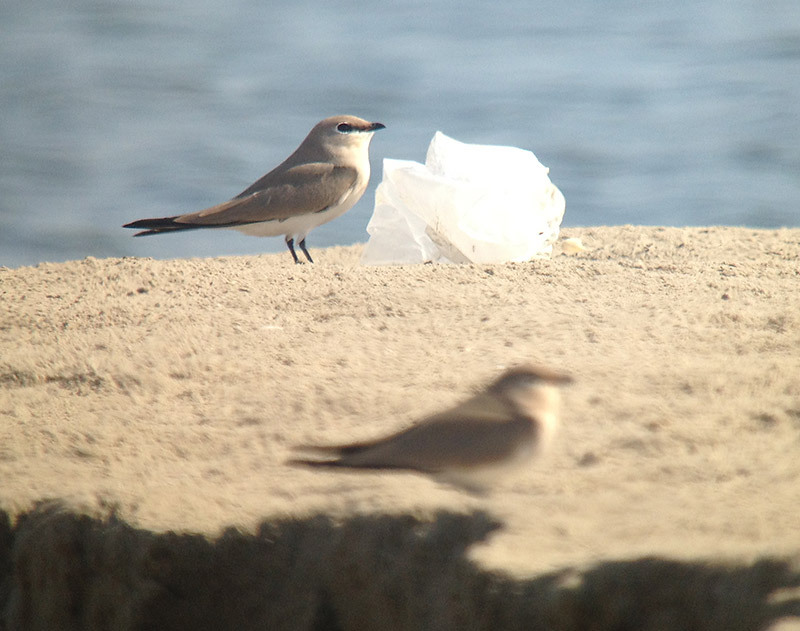 At the beach pool, just a single Small Pratincole remained; ten small tern sp. (Little/Saunders’s) were present on the beach. 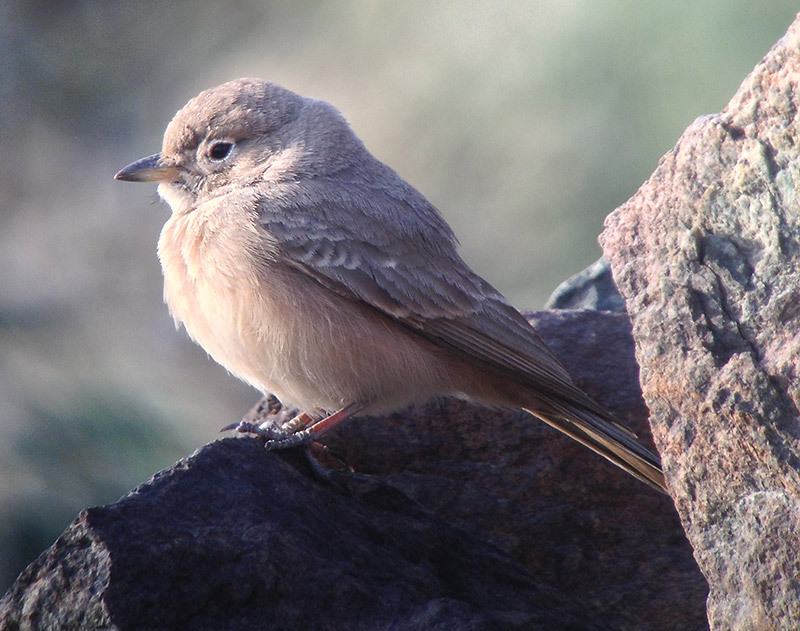 Mirbat (10.11) An Isabelline Wheatear was present just north of the town. Ras Mirbat (10.11) We followed the new road east out from the southeast corner of the town (16°58'39.38"N 54°41'35.01"E); at the end, some rough tracks run south to a football pitch and a shelter. Seawatching was the only area of our trip were we felt a January visit was a disadvantage. Previous trip reports had suggested this point was very good for seawatching; we had just a couple of very distant unidentified tubenoses passing by. Closer in, a Brown Booby was sitting on a buoy and several Masked Boobies and Whimbrels passed; Black-crowned Sparrow-larks were found on the areas of rough ground. We camped at Khawr Rawi where a European Nightjar was seen at dusk. This was the only site where we were pestered by mosquitoes; some DEET spray was extremely effective at deterring them, though. Khawr Rawri There was no sign of the Watercock but an Eastern Imperial Eagle was on the rocky outcrop west of the north arm. A walk along this rocky outcrop gave good views across the main body of the khawr, though there was little of any real note; two Tufted Ducks, Shoveler, Wigeon, Pintail and a Great Cormorant. 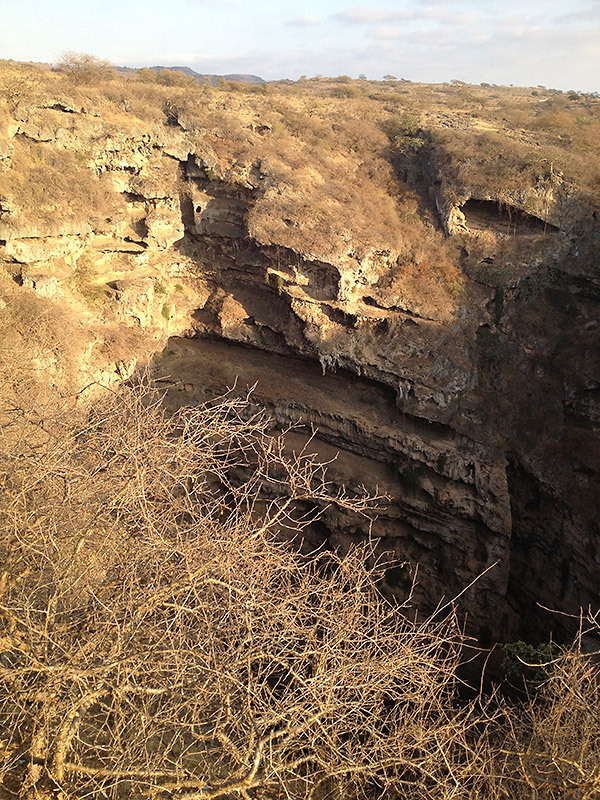 A Rock Hyrax was seen along one of the cliff edges. Sahlnoute Farm (10.1/F80) There is no access to Sahlnoute Farm. However, we spoke to the security guard at the entrance and he gave us permission to park behind the security hut and view the fields from just inside the farm entrance. From here we had a good (albeit distant at times) view of the main fields. 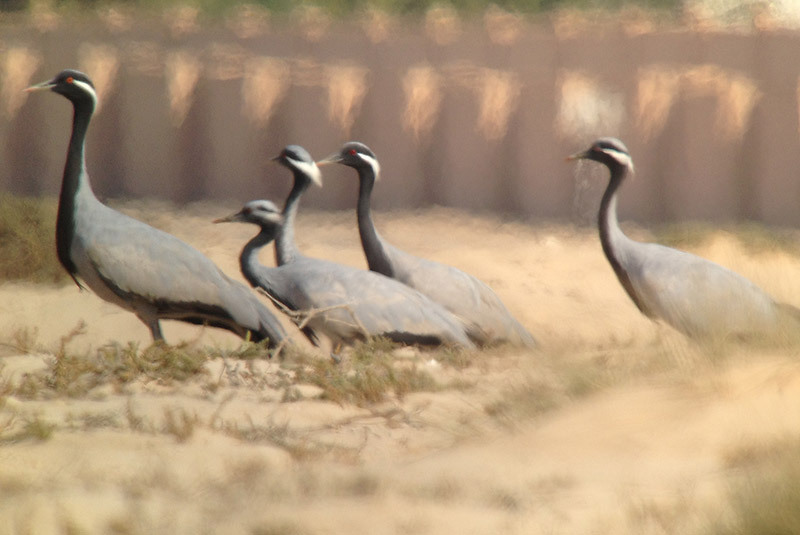 Highlights were a flock of 30 Sociable Plovers, five Demoiselle Cranes and a single Common Crane, a Caspian Plover with 300 Pacific Golden Plovers, a Richard’s Pipit, an Eastern Imperial Eagle, a Richard’s Pipit, and Tawny Pipits and a flock of Ruff. From the entrance it is possible to walk east or west along the wide grassed verges of the main road; you can then view the farm fields through the wire fence. Most of the action seemed to be concentrated around the fields near the entrance, except for a flock of 45 Cattle Egret following a grass-cutter and a male Pallid Harrier quartering the grassy fields. We drove west along the main road and parked the car at 17° 1'51.71"N 54°11'10.50"E (take the side-road before doubling back across the waste-ground heading back east towards the southwest corner of the farm boundary); from there we walked back along the boundary fence. This gave us a better view of the plover flock, including the Caspian Plover, though a Peregrine soon spooked the flock and they moved on to elsewhere on the farm. Salalah Driving west, a large raptor was spotted over the ‘horse roundabout’ (17° 1'34.73"N 54° 8'36.65"E); it proved to be an adult Crested Honey Buzzard, joined by a second individual. Salalah dump The dump is located west of Salalah city, close to Port Salalah (10.14). From the main road, take the road northwest from the ‘fish roundabout’ (10.14/K40) for about 3km; go straight over (second exit) at the roundabout at the end of the dual-carriageway and follow the rough dusty road to a T-junction (16°59'5.82"N 53°57'56.31"E); turn right and the dump is located on the lefthand side (16°59'10.99"N 53°57'43.67"E). 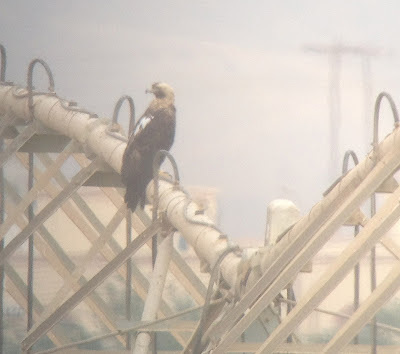 There is a track that runs along the perimeter of the dump and by viewing from ones vehicle it is possible to get great views of the Steppe Eagles that frequent the dump — we had up to about 300 birds. 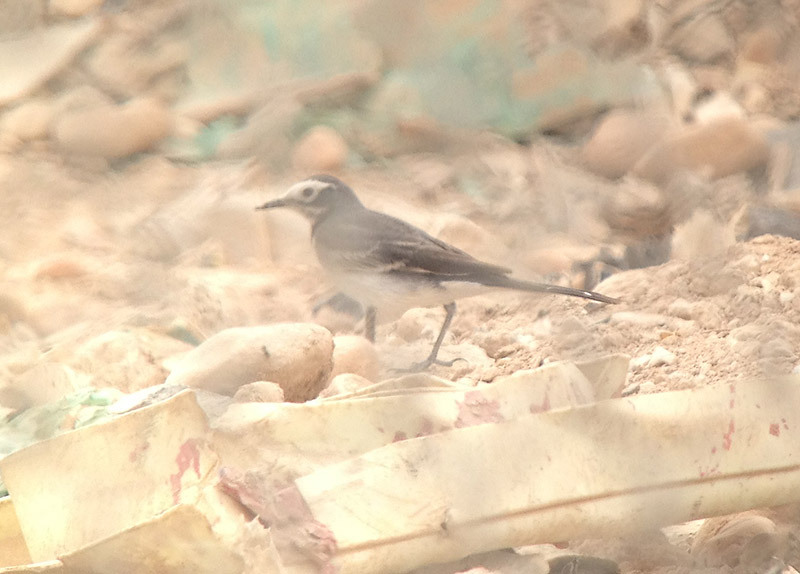 We also found a second-year Masked Wagtail (Motacilla alba personata) around the rubble on the edge of the dump. We were approached by one of the dump security staff who asked what we were doing; when they saw we were birders, they were happy to let us continue driving along the perimeter track. Close to the dump is a water-treatment/sewage works. 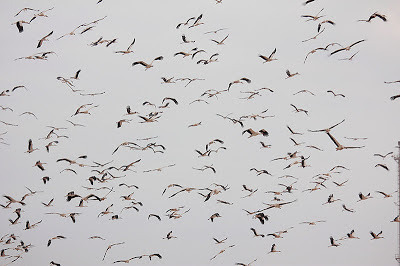 Some 900 White Storks were gathered here and amongst them we located 68 Abdim’s Storks. To access the water-treatment works, take the rough track off the south-bound carriageway of the main road at approximately 16°59'3.63"N 53°58'38.48"E (0.3 km southeast from the roundabout). Follow the track southeast parallel to the main road and to the line of pylon then, at 16°58'55.23"N 53°58'42.95"E, turn southwest and follow the track around the perimeter of the water-treatment works. There is a large metal gate that allows easy viewing of the pools at the west end of the site (16°58'44.09"N 53°58'38.86"E). 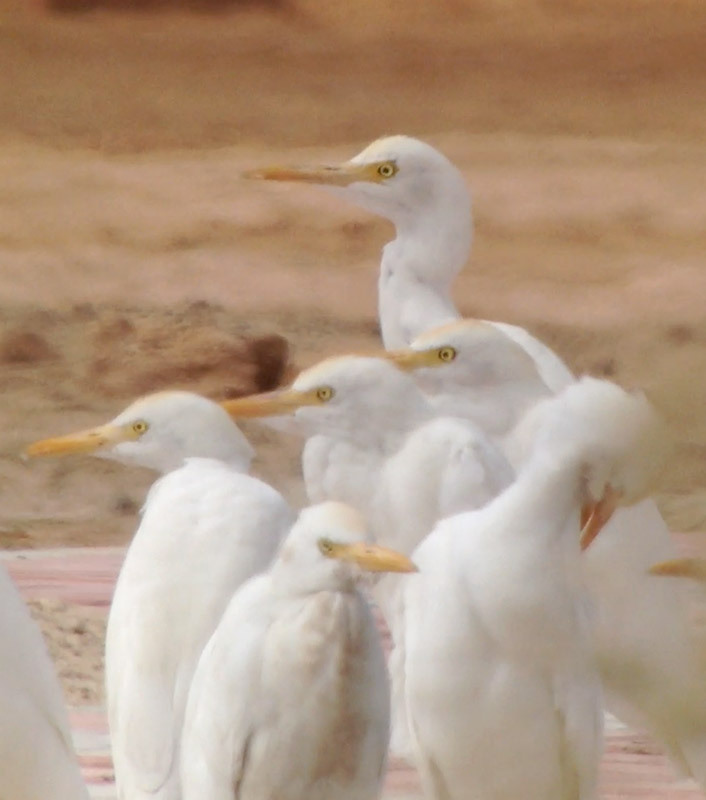 Al Mughsayl (10.15) An Intermediate Egret was present on the pools between the road and the coast, as was a Squacco Heron, a Great White Egret, a Little Egret and an Osprey. Good views of Brown Booby were had from the beach. The khawr held good numbers of Coot and a Little Grebe. 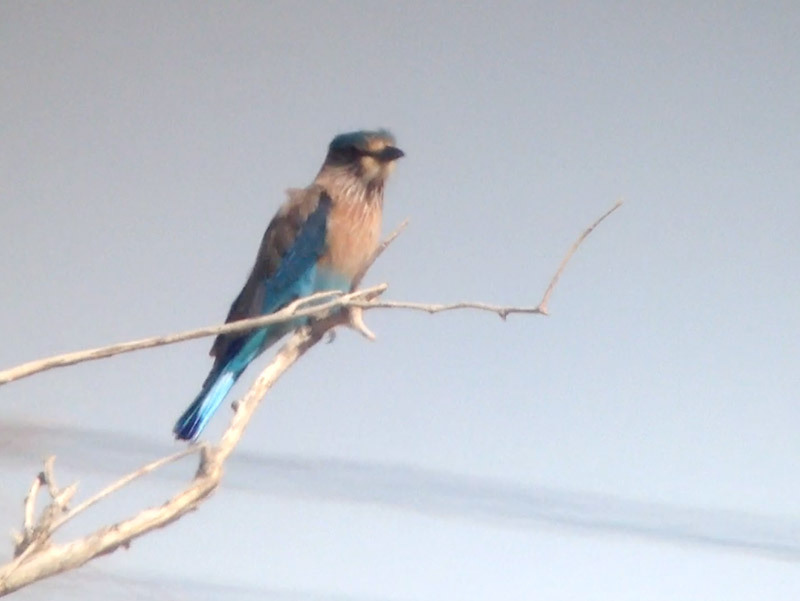 To the east of the khawr we encountered our first Little Green Bee-eaters of the trip. We travelled along the track as far as the small pool (16°53'22.86"N 53°46'36.51"E); although the area looks like it might be good for crakes etc, there was nothing present on our visit. 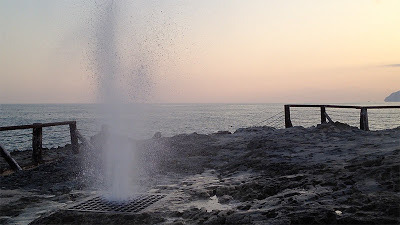 The nearby blowholes are worth a visit. Seawatching from here is probably productive at the right times of year (we had just a couple of very distance tubenose sp. 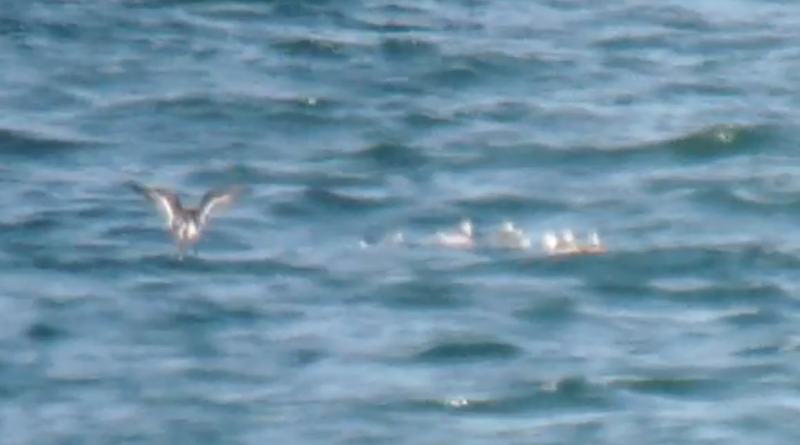 and some more Brown Boobies), while the blowholes themselves are worth devoting a few minutes to — at least as long as it takes for one of them to go off! Ayn Hamran We headed back to Ayn Hamran to camp, aiming to do some early morning birding there the following morning. After dark, several Arabian Scops Owls were calling and, up on the hillside, a pack of wolves were howling. On the otherwise of us, southeast of the roundabout, we could hear the most terrible noise. Naturally, we went to investigate. 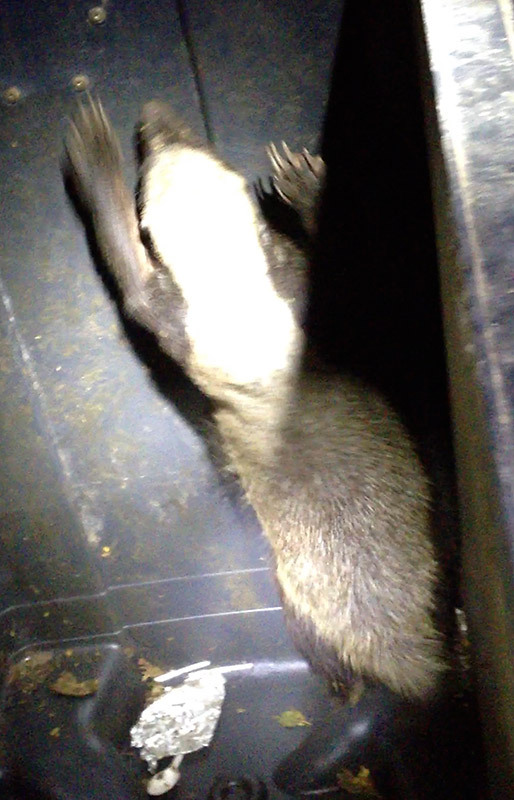 What we found was not what we expected: three Honey Badgers; two of them sniffing around one of the large industrial bins (as a side note, the Salalah area is extremely well managed with plenty of litter bins and plenty of litter-pickers. It’s really quite nice to see that the Omanis, at least those in the seats of decision making, are so keen to keep the environment as clean as they are). The third Honey Badger — the one making all the noise — was not so smart and had climbed the tree above the bin, entered the bin to find food and now couldn’t get out again. After a quick look, we released the beast. We also found a Genet up a nearby tree. The spot can be accessed by car (17° 5'48.42"N 54°16'52.59"E; follow the track north from the roundabout before following the track around to the right and south across the open gravel area) and it’s likely that the badgers regularly visit the bins; by sitting quietly in one’s car overlooking the bins, it might be possible to see Honey Badgers are they come to scavenge. Ayn Hamran Two Black-crowned Tchagras were located in the thorny scrub north of the roundabout; African Paradise Flycatcher, Arabian Warbler and Arabian Partridge were also seen. 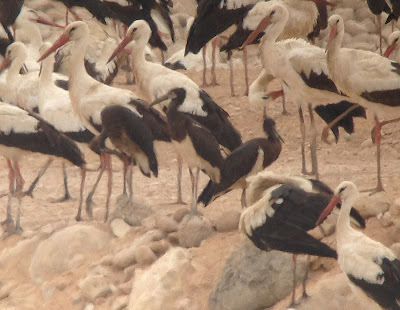 East Khawr (10.2) Despite its close proximity to the city, there were plenty of birds present at East Khawr: five Squacco Herons, 26 Ruff, 15 Pintail, Teal, Shoveler, Bluethroat, three Black-tailed Godwit, 46 Glossy Ibis and five Cattle Egret (ibis). The best sighting was of six cranes, five Demoiselle (four adults and a 2cy) and a Common Crane — undoubtably the same flock that was present at Sahlnoute Farm the previous day. Al Balid Archaeological Park Entrance to the park (17° 0'31.82"N 54° 8'8.00"E) is 2 Rials per vehicle. 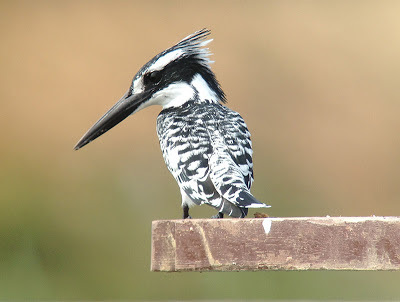 The birds here, though not numerous, give good views and there is a birdwatching tower at the far eastern end of the site (17° 0'33.45"N 54° 8'25.79"E) that overlooks both the khawr and a reedy channel. 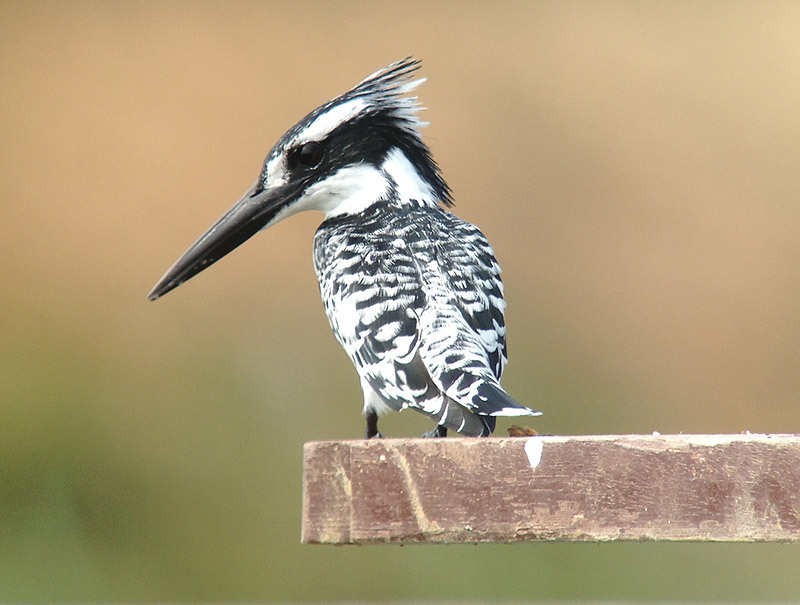 A female Pied Kingfisher had been present since November and is only the 7th record for Oman. 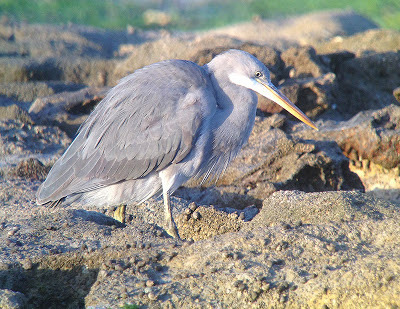 Other species seen included a juvenile Purple Heron, seven Cattle Egret (ibis), twelve Whiskered Terns and six White-winged Black Terns, and four House Crows. Two honey-buzzards were seen circling over a nearby plantation and two Greater Spotted Eagles and 19 White Storks passed over. Three Little Grebes were seen, one of them well at close range when it could be noted that the bird showed a dirty-yellow iris presumably representing a link between the red-eyed European/African races and the yellow-eyed Asian races. Jarziz Farm (10.1/K34) In comparison to Sahlnoute Farm, Jarziz Farm was relative poor for birds. However, it had the advantage that we could access the entire site; after calling into the office on arrival, we were given permission to drive anywhere we liked on the farm. Huge numbers of Collared Doves were around the cowsheds but we could find nothing unusual amongst them. Several Yellow Wagtails “of assorted races” we feeding around the farm buildings, whilst out in the fields we found Red-throated Pipit, Short-toed Eagle, Imperial Eagle, a Steppe Grey Shrike and three fly-by Rose-coloured Starlings. Tawi Atayr sinkhole (10.9) The Yemen Serins were easily located with at least six seen around the sinkhole car park (10.9/G17); a Wryneck was also seen briefly and a showy South Arabian Wheatear was singing from the roof of the ‘barn’. It’s worth walking the short distance to the sinkhole; it’s an impressive site... and sound — the echoing calls of a large number of Tristram’s Starlings in the sinkhole adds to the experience (for any Star Wars fans, think Utapau in Episode III). The sinkhole is also home to a pair of Bonelli’s Eagles. 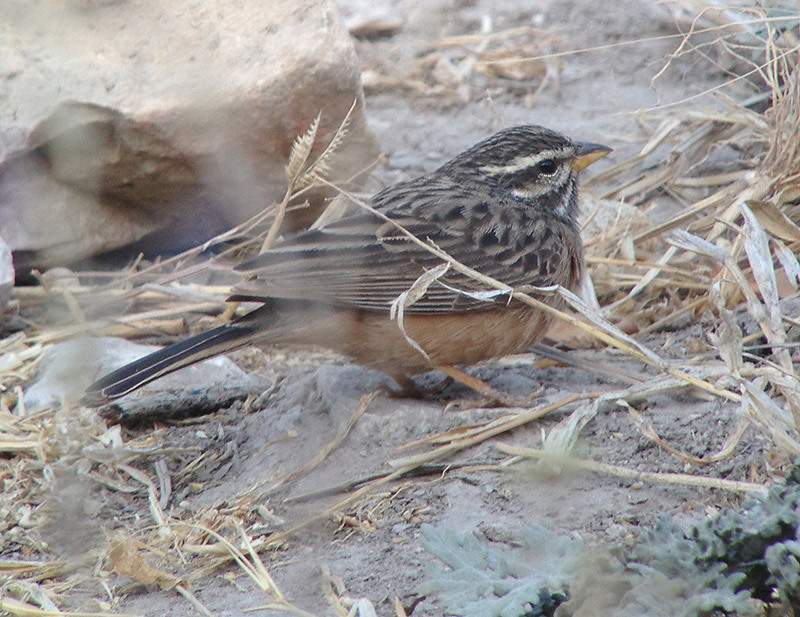 Following advice from Petter Olsson, we made a roadside stop at 17°06.781'N, 54° 28.870'E where we caught up with our only Singing Bush Lark of the trip. 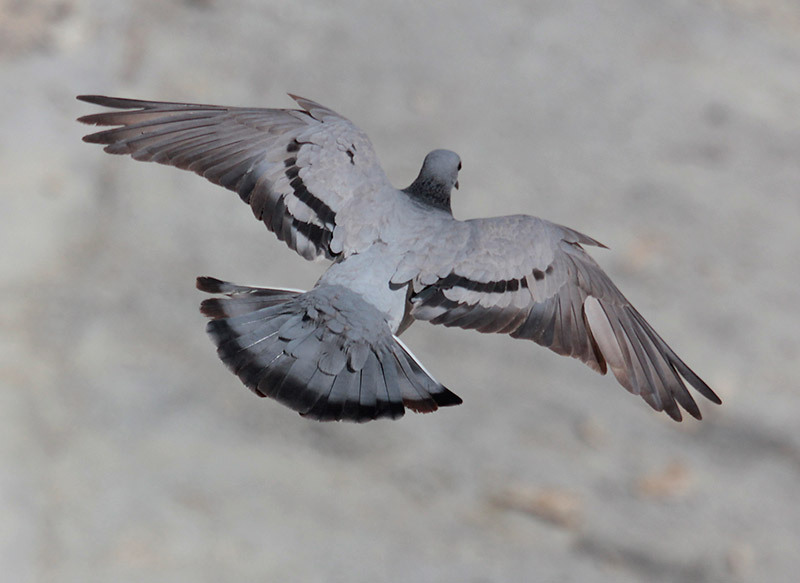 The bird behaved almost like a mouse, remaining still for periods before making lightening-fast scuttling dashes. 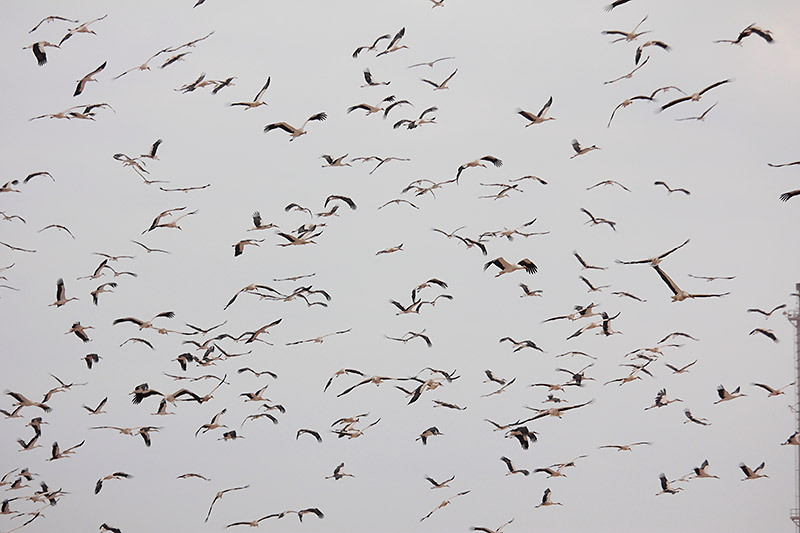 When taking flight, the speed at which the bird leapt from the ground was nothing short of extraordinary. Wadi Darbat We camped again at Wadi Darbat. 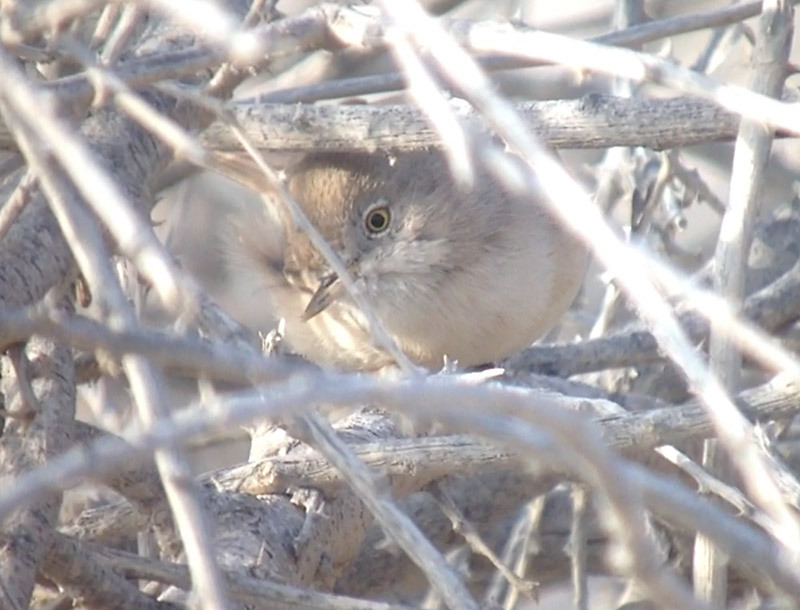 As dusk fell, an Arabian Scops Owl (one of many) was calling reasonably close to where we had chosen to camp. We attempted to track down the bird, though with no luck (despite hearing many during our time in the south, we failed to see one). However, whilst returning to the tent, a large owl flew over the wadi and alighted in the trees at the top of the hill on the west side of the valley (17° 5'57.09"N 54°27'2.04"E) — a Spotted Eagle Owl! It gave good views, albeit in silhouette but clear enough to see the bird’s ear-tufts, before moving out of site and calling then singing. The song is extremely low-pitched and easily drowned out by the insect noise in the valley. Wadi Darbat Two second-year Black Storks were in the pool opposite the café/toilet block. We started our journey back north, traveling across the upland grassland north of Salalah. At 17°16'46.65"N 54° 9'15.02"E we encountered a large flock of Bimaculated and Greater Short-toed Larks. 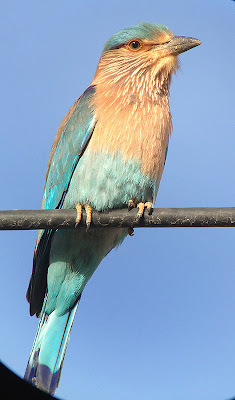 The only other sightings of note in this area where a couple of Imperial and Greater Spotted Eagles at various points along the road. Wadi Rabkut We called in briefly at Wadi Rabkut to look for African Collared Dove. After a short search, we found one in the shade of a tree at approximately 17°41'7.27"N 54° 9'51.56"E. Although views were a little distance, the whitish underbelly was still reasonably obvious and the bird gave a different overall impression than Eurasian Collared Dove. 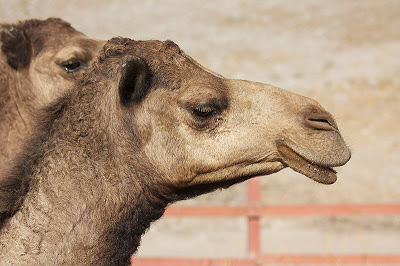 Most notably, the head shape appeared subtly different; squarer and higher peaked at the front. Al Balid (Al Beed) Farm (7.5) The most notable find on the 6km drive from the main highway to the farm was a desiccated Quail hanging from a barbed-wired fence. The farm itself was relatively quiet with a couple of Corn Buntings, a Ménétries’s Warbler, two Hoopoe Larks and some Tawny Pipits. 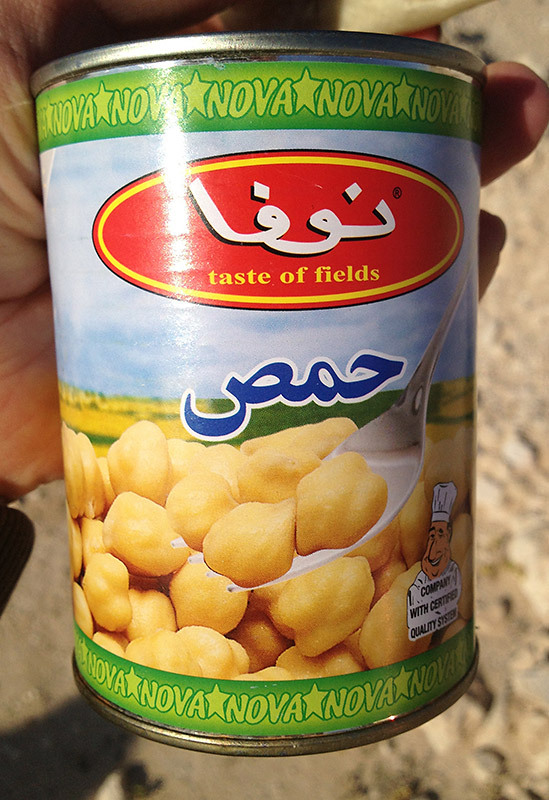 Further exploration of neighboring farms revealed little else of note. Muntasar (7.3) It is possible to reach Muntasar in a 2WD, though not all of the tracks are suitable. We approached from the south and pulled off the road at point 7.3/F17. This required some off-road driving to reach a track which ran parallel with the highway for a short distance before coming to a T-junction. It then became apparent that a much better option would have been to stay on the highway until just south of the communications tower and to take the track from there (19°17'36.44"N 54°37'13.17"E). We followed the track (which was, by and large, in good condition along the entire length that we drove) as far as the southern turning for Muntasar (7.3/F15); however, we decided that the track was not solid enough for our 2WD to drive along and continued along the main track to the northern turning (7.3/F11). 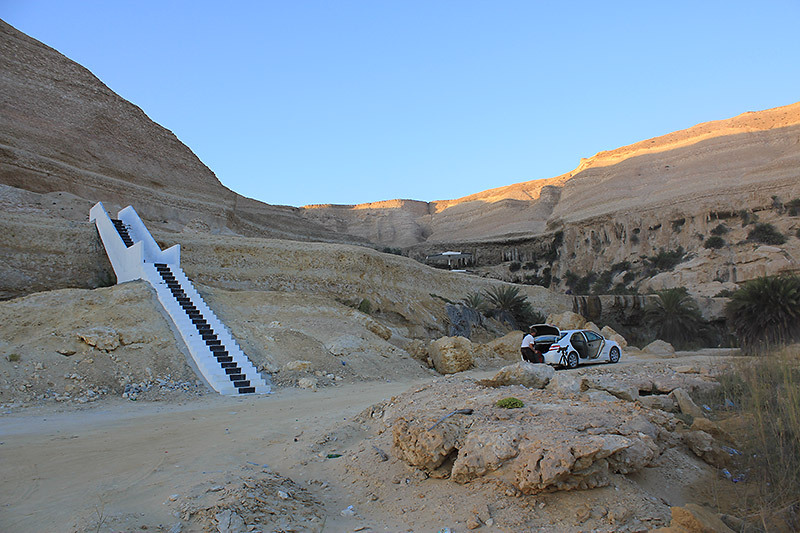 This track was much better and we were able to drive all the way to the oasis at Muntasar with no issues. We arrived at dusk and found a nightjar sp. (probably European) hunting over the reeds behind the water. We camped on site. 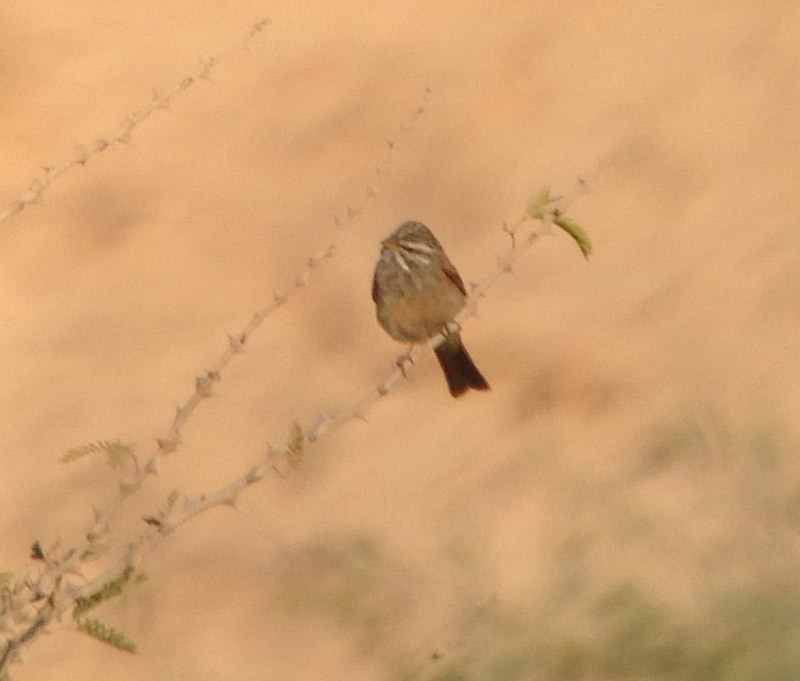 Muntasar Two Water Pipits, a female European Stonechat and an Asian Desert Warbler were all seen in the vicinity of the oasis. At about 09:00, 175 Spotted Sandgrouse arrived and spent most of their time sitting around on the sandy plain near the oasis. They were still present when we left some time later. Qatbit (10.4) Qatbit is effectively an Omani-style truck-stop. There’s a petrol station, a couple of restaurants and a motel. However, the grounds around the motel/petrol station are well vegetated and provide excellent birding. 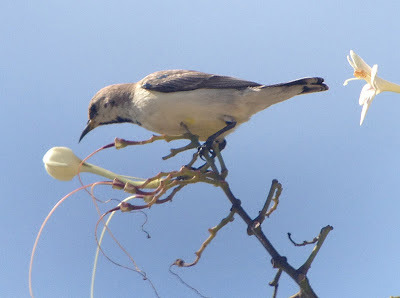 Several Grey Hypocolius were seen by three members of the group; they proved to be elusive and hard to relocated and were not seen again by dusk. 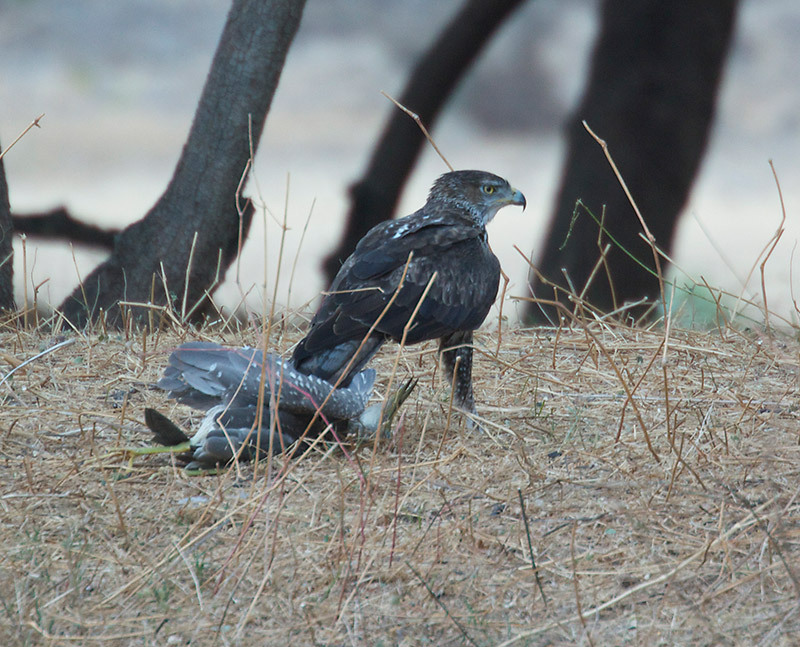 An adult female Asian Koel was a surprise, as was a dead Great Cormorant. 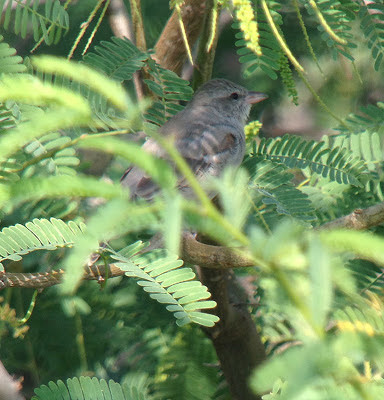 Other notable birds seen included several Chestnut-shouldered Petronia, a couple of minula-type Lesser Whitethroats, three phoenicuroides Black Redstarts, an Isabelline Shrike, good numbers of Nile Valley Sunbirds, Song Thrush, Bluethroat, a Hume’s Leaf-warbler and a Red-breasted Flycatcher. The latter two were located in the more densely vegetated eastern corner (19°10'27.48"N 54°30'16.00"E). 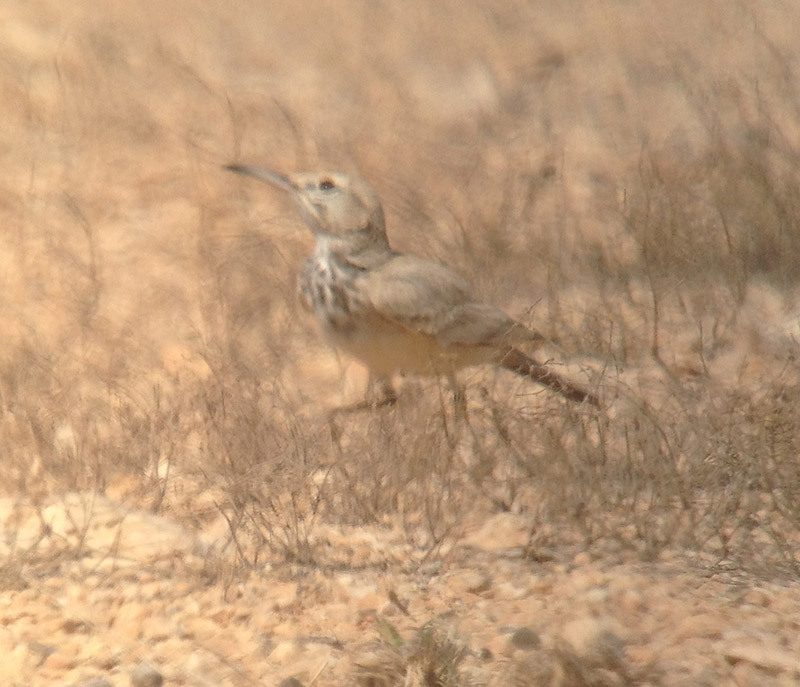 Stopping at various points along the track that travels north from the main road opposite Qatbit (19°12.624'N, 54°29.032'E ) gave us our only sightings of Cream Coloured Courser on the trip but little else. That evening we enjoyed a curry at the restaurant at Qatbit — marred only by the large number of feral cats that gathered around our table — before driving north overnight through a sandstorm to the north coast. Sun Farms, Sohar The security guards at the front desk at Sun Farms were in fact some of the unfriendliest Omanis we met; they spoke no English and simply thrust the sign-in book towards us when they saw we wanted to go birding around the farm. Nonetheless, access was simple (sign in, sign out and write a brief list of the birds you saw in the sightings book; though this sightings book is only brought forward as you leave so you can see that you’ve missed rather than read about what to expect) and ones in the farm you can drive along any of the tracks to reach any of the fields. Much of the farm is dry and overgrown, though these areas held plenty of Grey Francolins, an Oriental Skylark and several Richard’s Pipits. 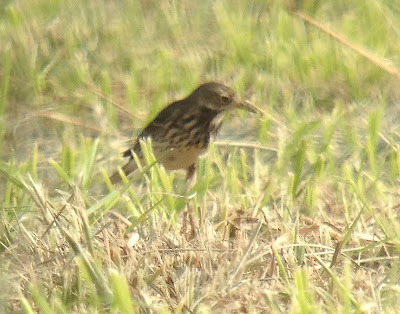 We soon found a grass field that had been recently cut; it held large numbers of Red-wattled Lapwing and Indian Roller, 7 White-tailed Lapwings, a male Caspian Stonechat, a couple of Red-throated Pipits, a sizable flock of Water Pipits and at least two Siberian Buff-bellied Pipits. 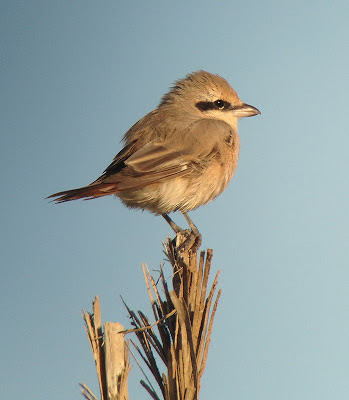 Other birds seen around the farm fields included five Corn Buntings, at least ten Namaqua Doves, Indian Silverbills, Isabelline Wheatears, Chestnut-bellied Sandgrouse, and an Imperial Eagle. Liwa We arrived (through luck rather than judgement) at low tide. A Collared Kingfisher sped by along the channel at 24°32'30.61"N 56°35'15.79"E before heading off into the mangroves — a frustratingly brief sighting. 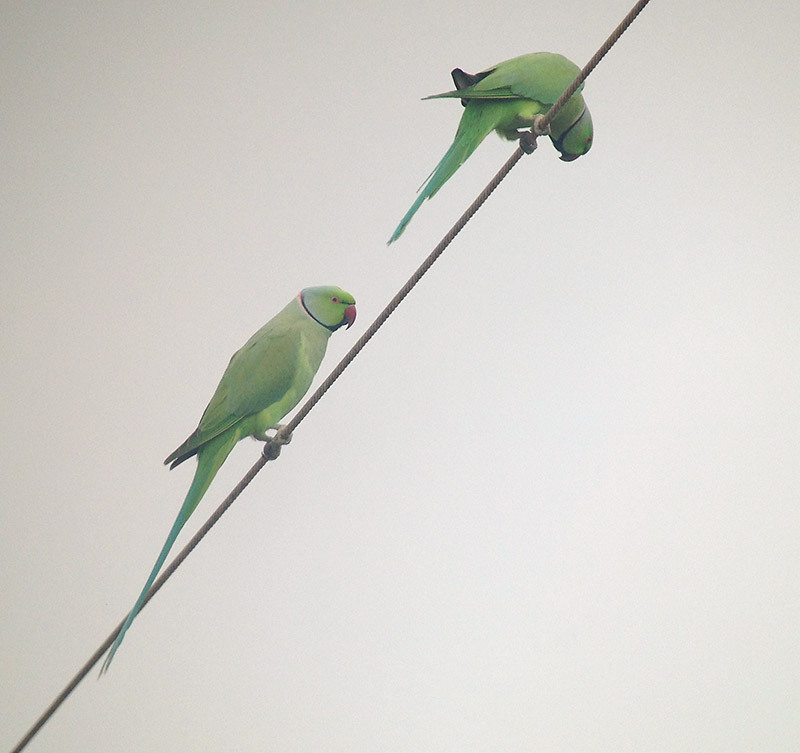 Continued searching until dusk reveled only 6+ Common Kingfishers, a White-cheeked Bulbul and plenty of House Crows. We camped on the beach. Liwa We took advantage of the low morning tide to search again for Collared Kingfisher and again managed one frustratingly brief sighting when a bird was flushed from the mangroves at 24°32'17.87"N 56°35'22.22"E. Other sightings included a Striated Heron, a Pallas’s Gull, a Steppe Grey Shrike and a mixed flock of Lesser and Greater Sand Plovers. Offshore, good numbers of Red-necked Phalaropes were present and three White-cheeked Terns passed by (including one breeding plumaged adult). Shinas We parked the car on the beach near to the picnic area (2.5/D84) and walked north along the beach as far as the inlet (2.5/D87). Thirty Pallas’s Gulls were present at the inlet and good numbers of Red-necked Phalaropes were present close offshore — the first time the birds were truly close enough to obtain reasonable views; identification of most previous sightings had relied on faith in distribution maps rather than evaluation of the birds themselves! Shinas Harbour The harbour (2.5/D69) held a Socotra Cormorant and a Striated Heron. Khatmat Milahah (2.6) We followed the track for a short distance (accessed from 2.6/D60) about as far as 24°56'50.55"N 56°22'3.58"E. From here we continued on foot through the trees where we found three Variable Wheatears; also nice views of Purple Sunbird and Little Green Bee-eater. 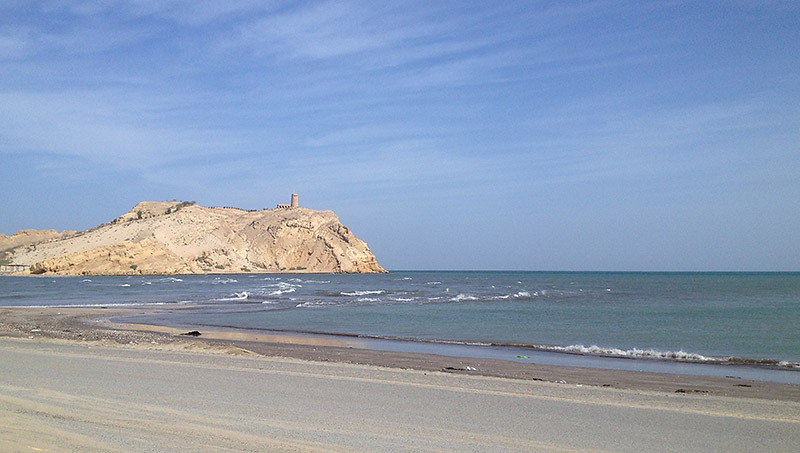 Miyrayr Al Matarish We headed into the nearby town of Miyrayr Al Matarish to find a restaurant; before we ate, we tried seawatching from the beach () for a short time. It paid off as we managed to see a few Persian Shearwaters, some at reasonable range. 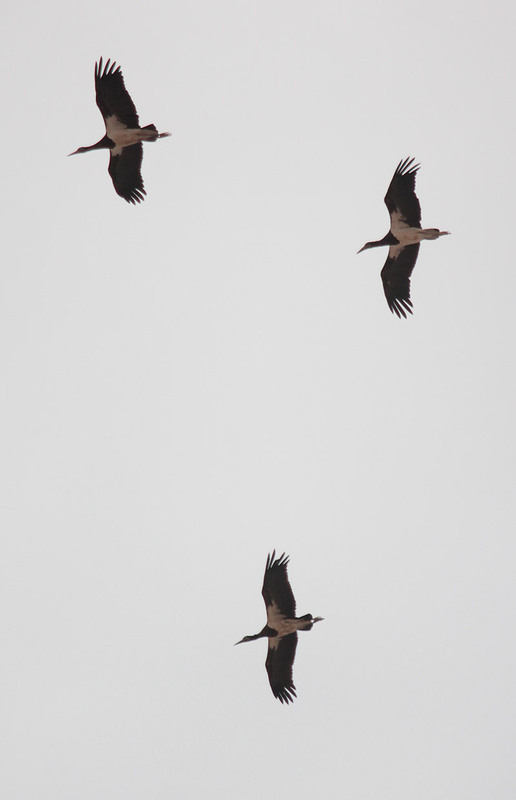 A couple of Socotra Cormorants passed amongst the Great Cormorants. 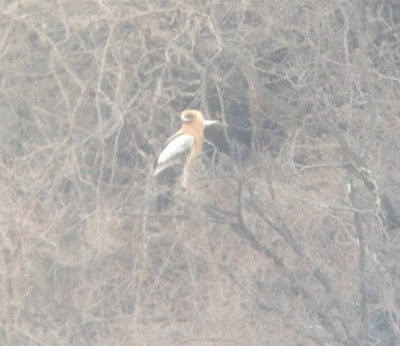 Also a mystery bird; largely white with darker flight feathers and lesser coverts. It was cormorant sized and flew like a cormorant... so was probably ‘just’ a leucistic cormorant, but it didn’t half look odd! We camped at Khatmat Milahah near to the first ridge of hills. The only sighting (hearing) of note during the night was a fox sp. calling from the top of the ridge. Khatmat Milahah We started the day birding along and around the first ridge of hills (24°57'6.18"N 56°21'20.46"E); two Striolated Buntings, 5+ Desert Larks, an Asian Desert Warbler, a Red-tailed Wheatear and several minula-type Lesser Whitethroats were seen. Birding along the obvious green and relatively densely vegetated wadi at 24°56'41.13"N 56°21'13.36"E proved to be productive: it held several Plain Leaf Warblers and chiffchaffs — both Common Chiffchaffs and Siberian-type Chiffchaffs; two Red-tailed Wheatears, 8+ Tawny Pipits, two phoenicuroides Black Redstarts, a party of Arabian Babbler and more minula-type Lesser Whitethroats. 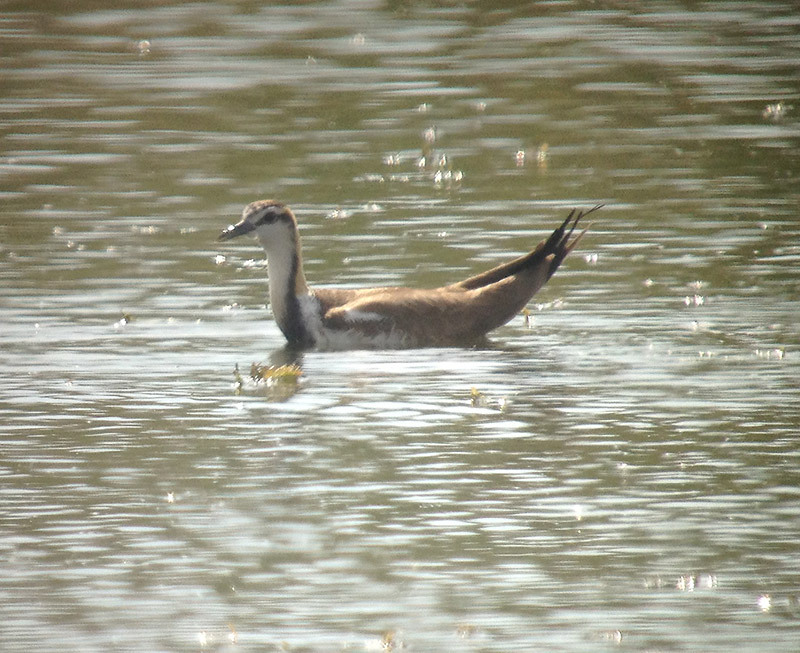 Liwa Back to Liwa; an Arctic Skua was offshore, a Little Green Bee-eater was present along the entrance road and there were still plenty of Red-necked Phalaropes offshore. No sign of any Collared Kingfishers. We camped on the beach again. Sun Farms, Sohar We left Liwa early and headed along the coast to Sun Farms. Access was again simple: the visitor book was thrust at us, signed, and the barriers were duly opened. We spent more time around the ‘near end’ of the farm this time and were rewarded with three Masked Wagtails around the cow sheds near to the farm entrance. A little further on, we had noticed that a number of ducks and herons were going down onto pools at the end of a large off-flow pipe (24°19'3.78"N 56°44'43.87"E). 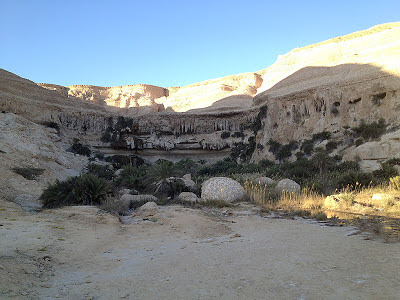 We headed out to investigate but discovered that the pools were surrounded by thick bushes that were impossible to penetrate and there was no way of viewing the pools. We did however flush a Common Snipe and a Pin-tailed Snipe, as well as several Green Sandpipers and Citrine Wagtails. On the other side of the track lie the farm settling tanks — access if along the side-track at 24°18'54.58"N 56°44'57.35"E; the pools are found at 24°18'53.11"N 56°45'0.12"E. Despite their rather barren sides, they held good numbers of waders and other birds: a Glossy Ibis, a Marsh Sandpiper, Wood Sandpiper, Black-winged Stilts, Whiskered Terns and White-winged Black Terns, Ruff, Temminck’s Stint and what were presumably the same Common Snipe and Pin-tailed Snipe as we had flushed earlier. In the freshly cut field, the male Caspian Stonechat was still present as was at least one of the Siberian Buff-bellied Pipits. A second-year female and an adult male Pallid Harrier were seen along with a Bonelli’s Eagle, two Cattle Egrets (ibis), at least two Pallid Swifts, and a flock of about 60 Chestnut-bellied Sandgrouse. 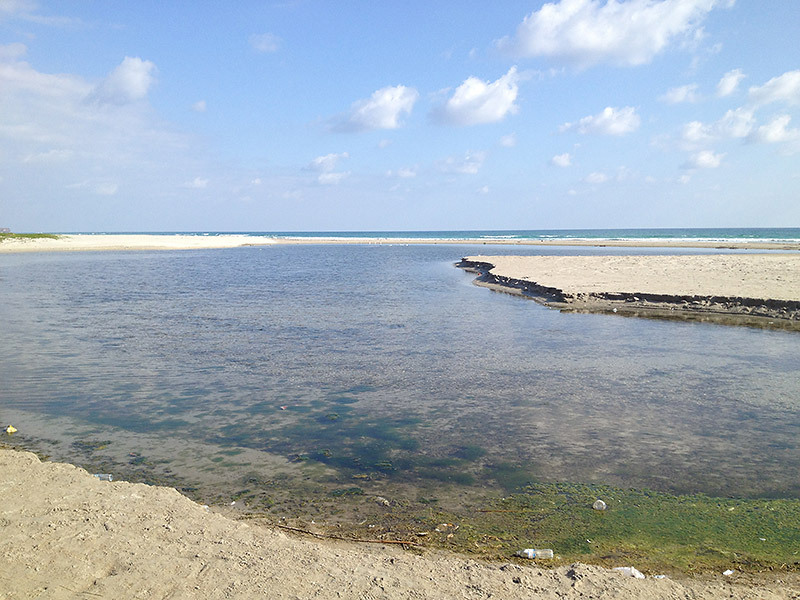 Sawadi Beach 2.1 This attractive location was popular with visitors. At low tide, a small gull/tern roost gathered on the sandy spit at 2.1/B83 and included Sandwich, Lesser Crested, Greater Crested and Caspian Terns, and a single Pallas’s Gull. 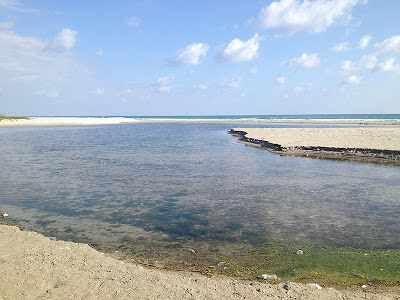 On Sawadi Island, a pair of Egyptian Vultures were present and in the channel between the beach and the island there was a lone Socotra Cormorant; an Osprey was fishing just offshore and a Bar-tailed Godwit was present on the beach. 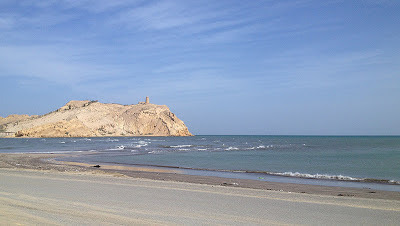 We moved on to the other side of Muscat, to the Yiti area, where we camped for the night. Yiti area (1.4) We started the day at the end of the track beyond Yiti village (23°31'56.19"N 58°40'45.54"E) where a Hume’s Wheatear was singing from the hillside. At least one Hume’s Leaf-warbler, a Blue Rock Thrush, two White-cheeked Bulbuls, a Red-tailed Wheatear, several Purple Sunbirds and an Indian Roller were present, along with several each of Grey Francolin and Fan-tailed Raven. 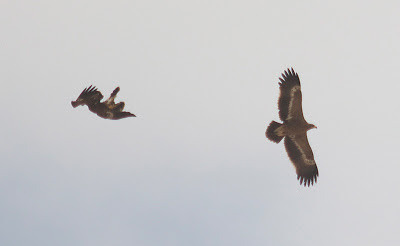 Following the road back towards Yiti village and through the palm plantation the other side of the village, making regular stops along the way, we noted three adult Egyptian Vultures (a pair and a single bird in the air together at 23°31'43.10"N 58°39'54.54"E, where a Greenshank, a Moorhen and a pair of Red-wattled Lapwings were also present on the roadside pool); several more Indian Rollers, another Blue Rock Thrush, another White-cheeked Bulbul and three Hume’s Wheatears (a pair at 23°31'21.23"N 58°39'56.69"E and a singleton at 23°32'5.73"N 58°40'5.42"E). Seeb A second-year Common Gull was with other gulls on the beach at 23°40'55.29"N 58°11'30.62"E. A Eurasian Spoonbill was on the lagoon at 23°41'22.94"N 58°10'13.65"E. From here, it was only a short journey to Muscat airport from where we caught our flight back home. An illustrated PDF (2.7 MB) of this trip report is available to download. A text-only version (designed to download or print off if you are going to Oman) — or any further advice on any of the sites mentioned in this trip report — can be obtained via email.